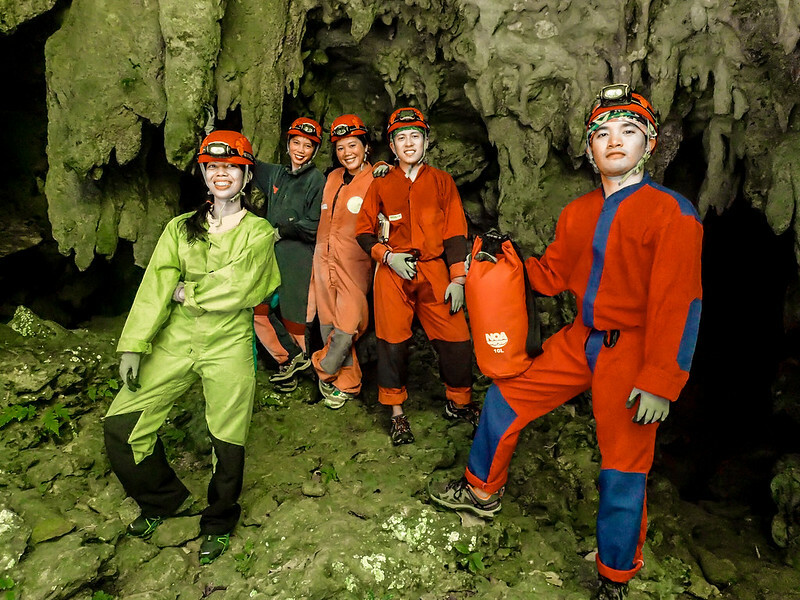 As I scan through the internet after hearing an invite about an exploration of the caves of Samar, I found a trove of pictures of foreign explorers on their cave suits than the locals of my country. There, I knew it was popular but why to most of the foreigners? It piqued my curiosity and opened up to many questions. 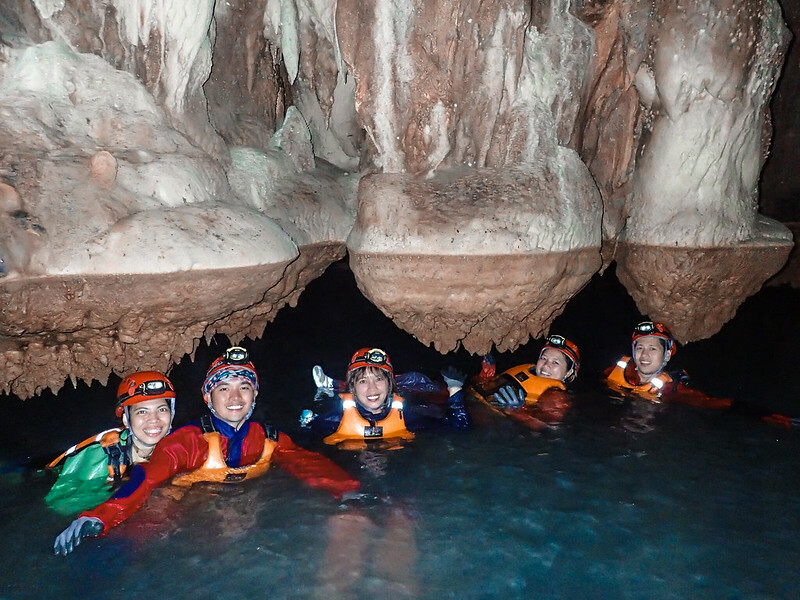 What is it about the caves that many foreign travelers and enthusiasts put their lives on the line just to explore the wonders beneath the surface of Samar? 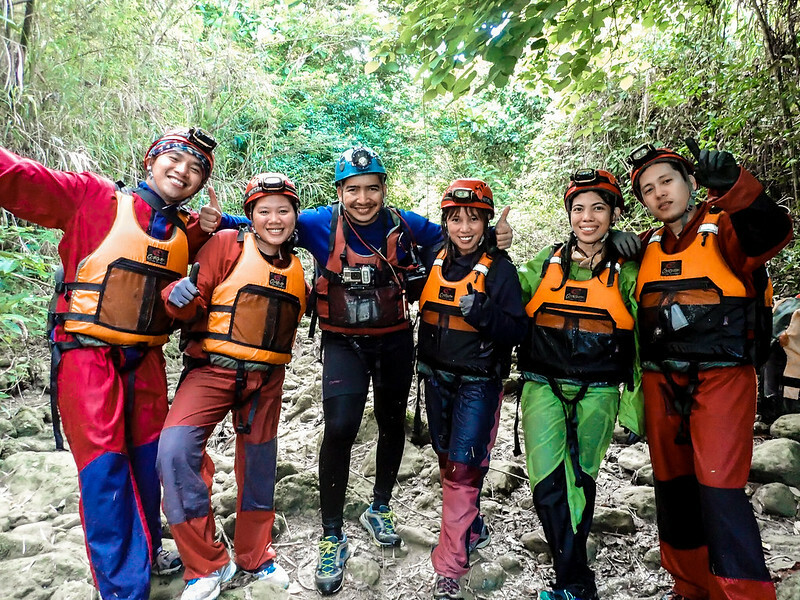 They travel far enough and even cross the vast oceans of the Pacific and the likes in hopes to have great adventures that will carve memories of the lifetime. I don’t know. 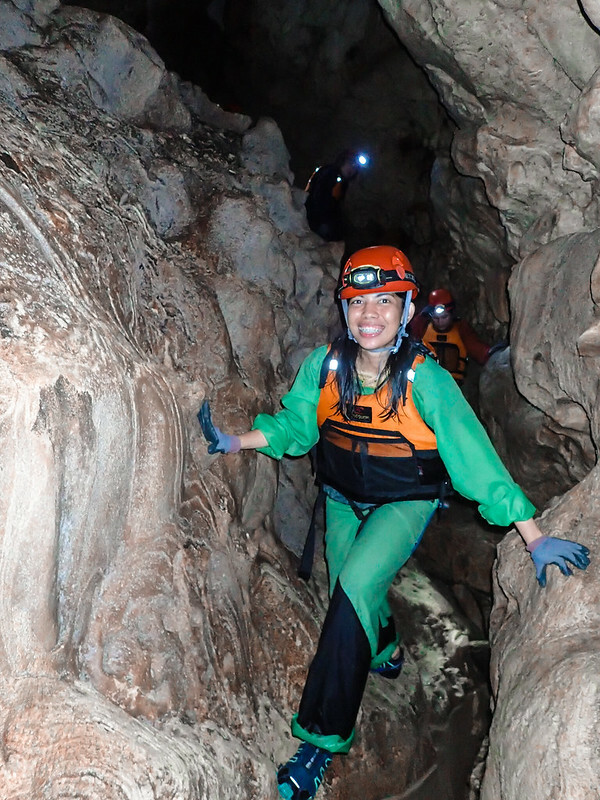 Until recently, after my 4 days of venturing into the deep caverns of Samar, I found my own answers. 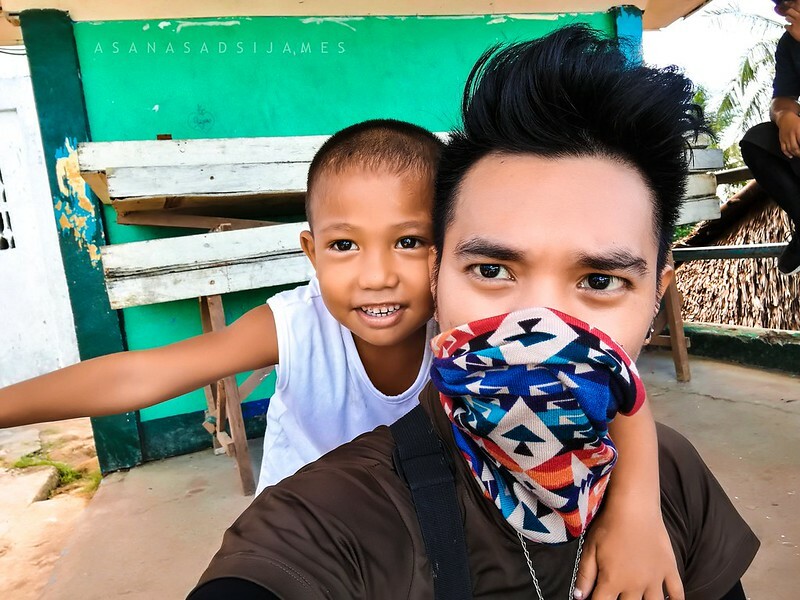 The uphill habal-habal ride took us to this quiet and simple barangay of Tagbaya-on in the municipality of Jiabong, Samar. Warm and beaming smiles of the local children welcomed us on that day. 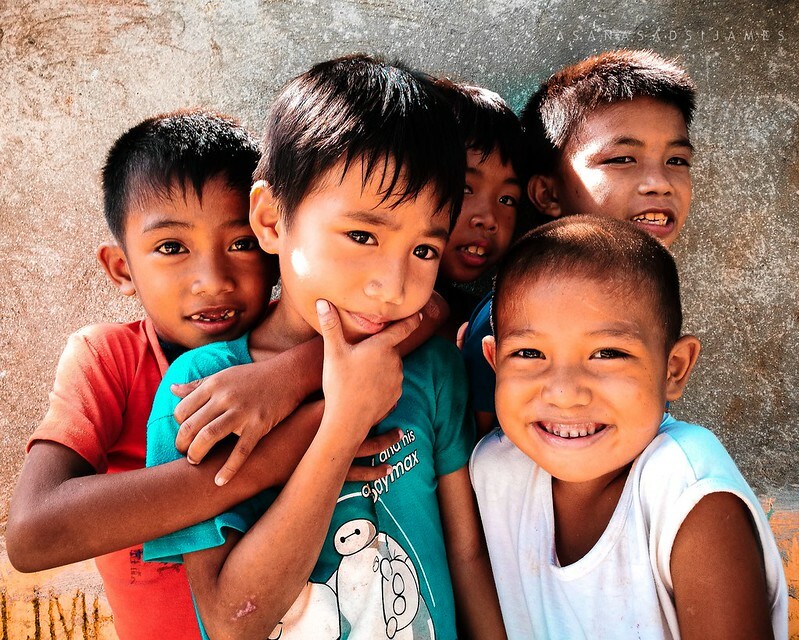 We took some photos and selfies together then they guided us to the registration area of the barangay. 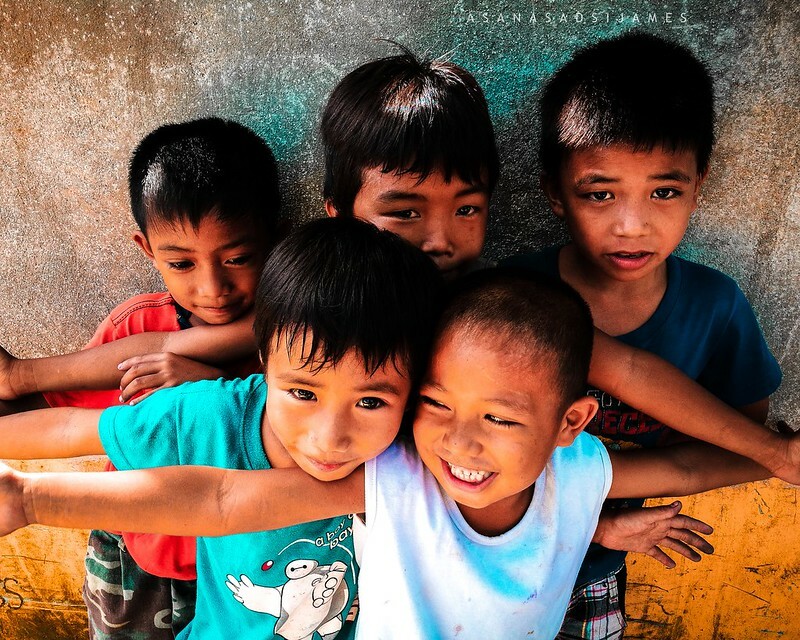 Fun and innocence painted all over their faces as we exchanged smiles and sweet gestures together. After we enlisted our names on the guestbook, our group then commenced our trek to an uphill and mostly downhill adventure. We bid goodbye to the local children as they were waving and smiling back at us. We started a little before 9 in the morning but the heat felt like on a scorching afternoon. Nevertheless, the trail offers scenic views I wasn’t expecting. 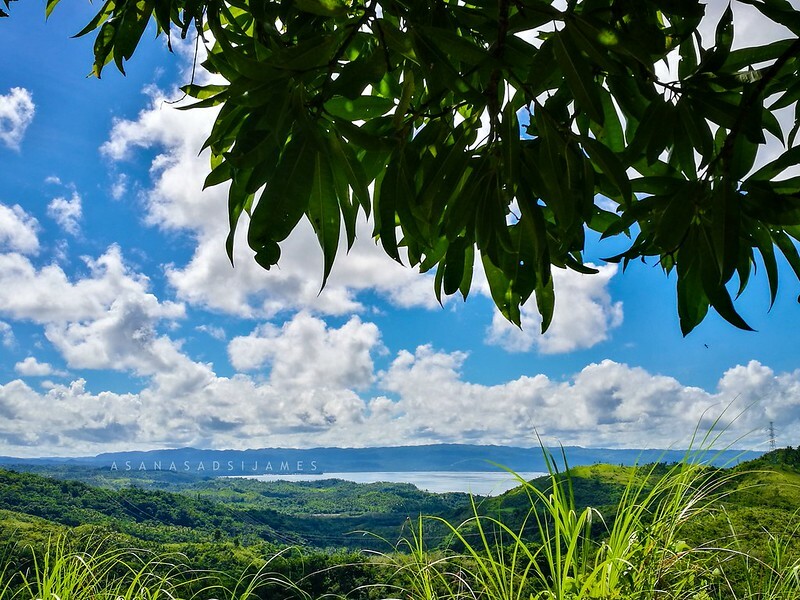 Breathtaking sceneries and vistas resemble somewhat like at the peak of Mt. Tapyas in Coron, Palawan with a view of dozens of neighboring islands and islets, and of course, the pale blue bay of Samar. 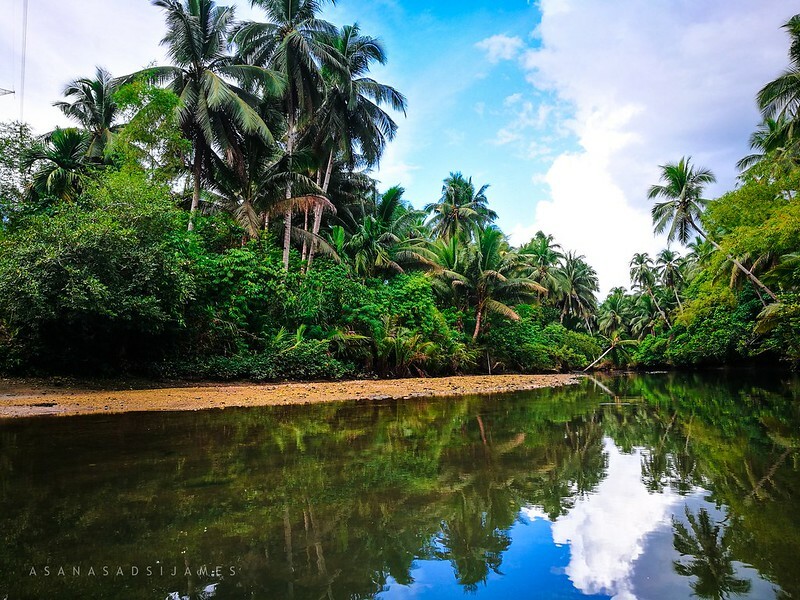 The trail is composed of tall cogon grasses and an array of coconut trees. I remembered our Mt. Minandar adventure with these nostalgic setting of flora. 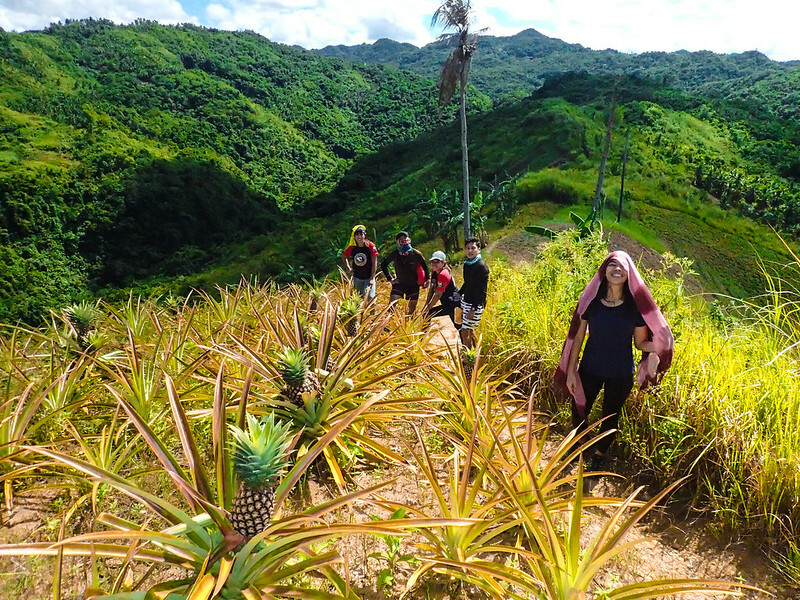 Then the uphill trek opened to a wide plantation of pineapples at the end. 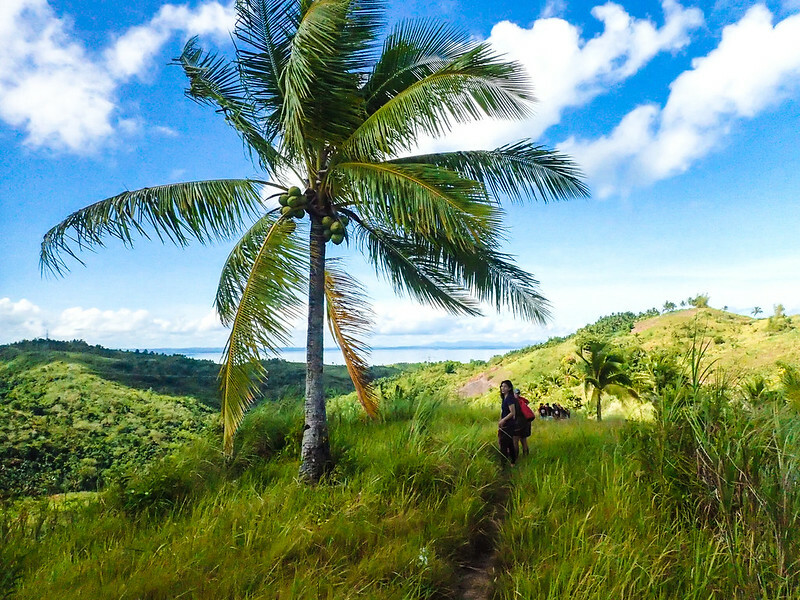 Though harvest season was over, we’ve seen few pineapples along the trail and on distant farmlands. 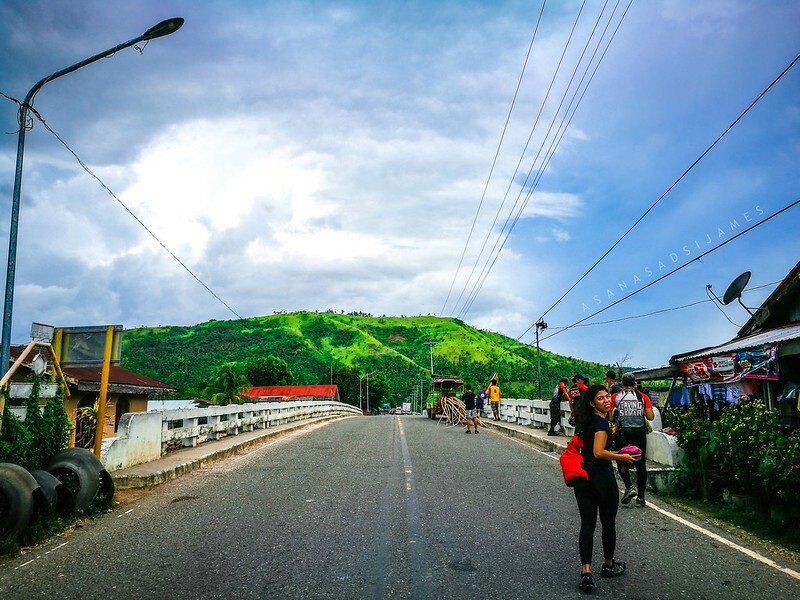 Pineapples are one of the agricultural livelihoods of the local and they’re selling fresh picks along the highways of Jiabong, Samar. 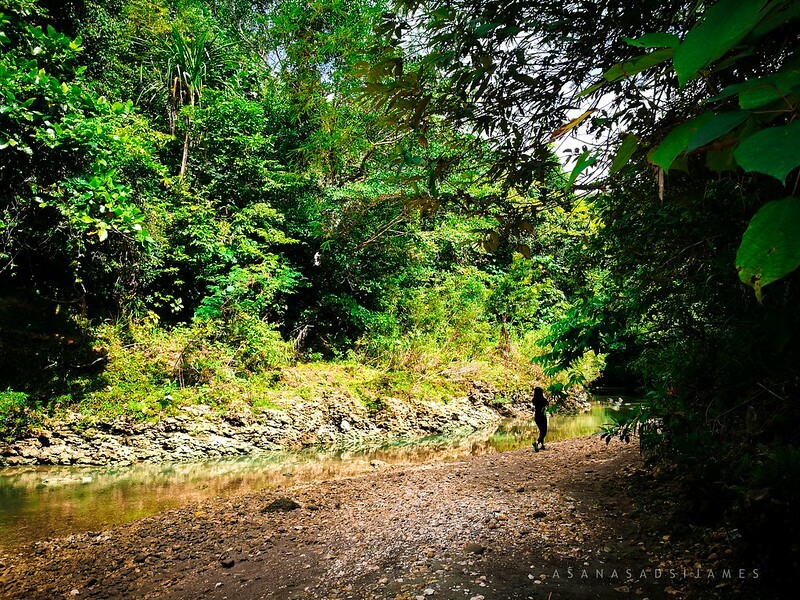 Minutes after, we took the downhill trail of loose soil and thick woods just along the plantation until we reached a riverbed. 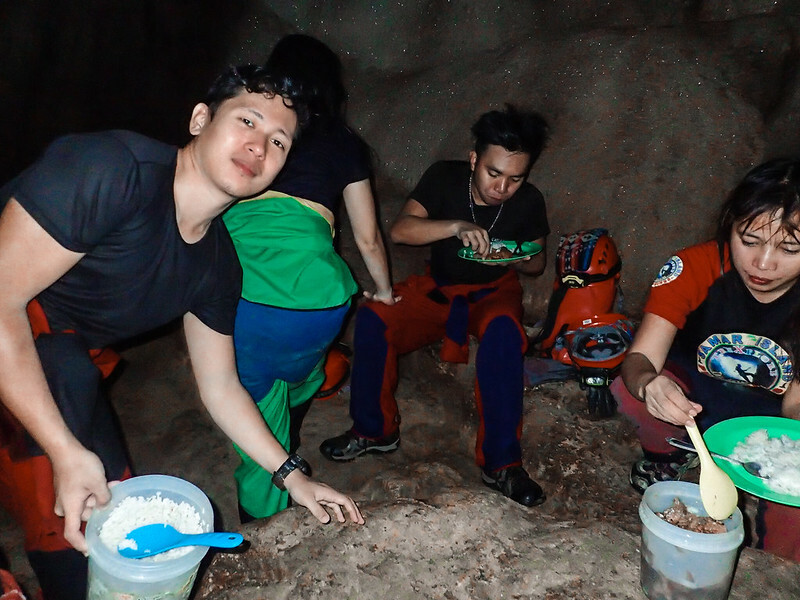 Sir Joni said that we’re nearing the entrance of Lobo Cave. 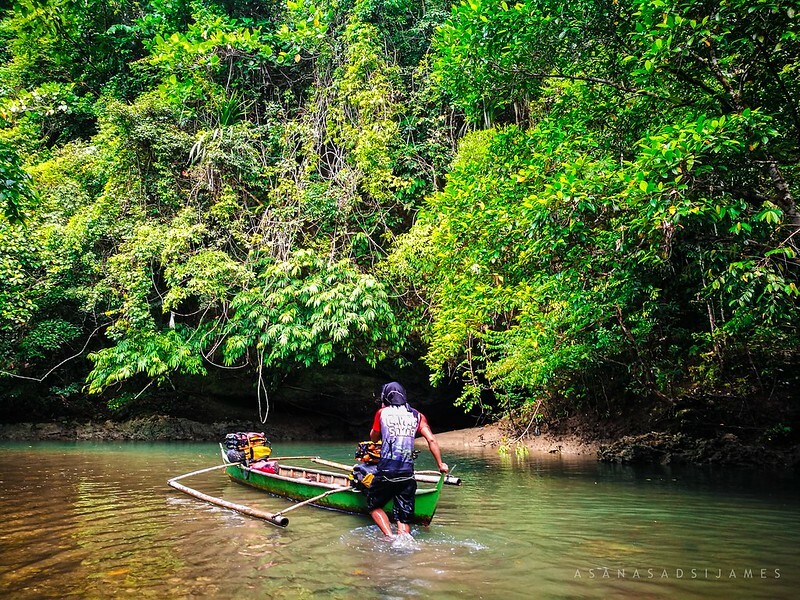 Few more trek on the woods along the riverbed and we’re facing the maw to the underground waterworld of Samar. 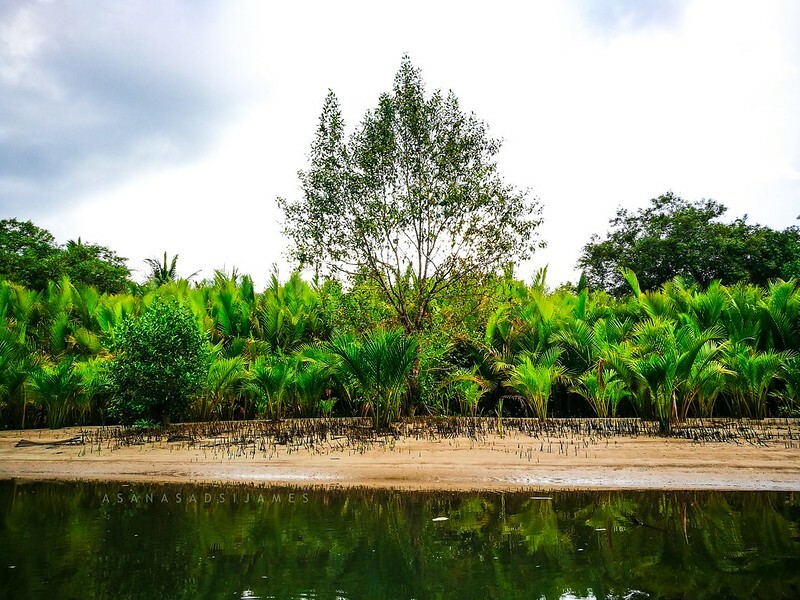 In this lush vegetation below the mountains of Jiabong lies the entrance of Lobo Cave. 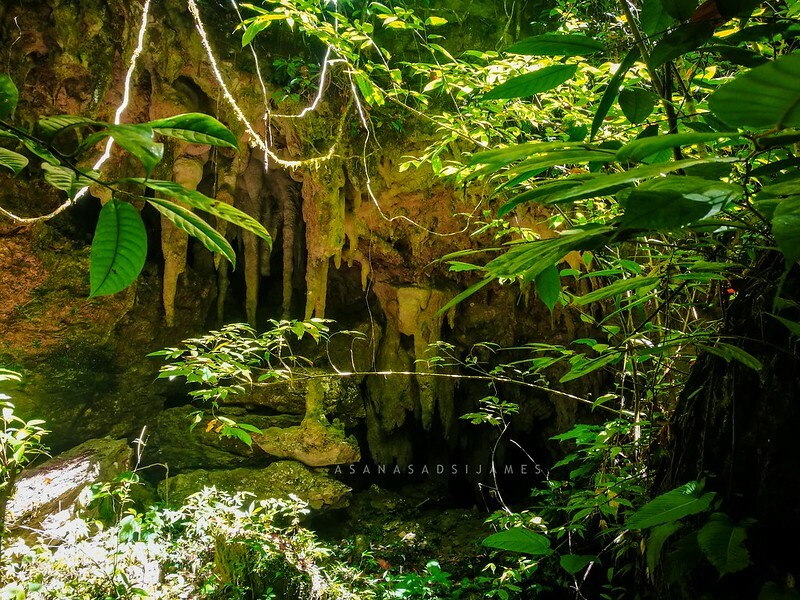 Thick woods covered the cave’s mouth and with its green teeth-like stalactites, it is seemingly unnoticeable amongst the woods. 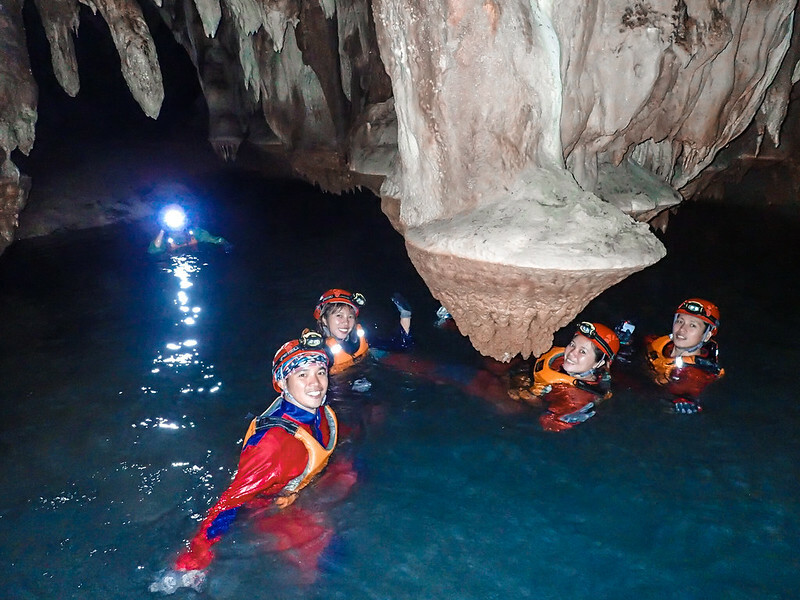 Dubbed as the most beautiful cave in Samar, I level down my expectation just to set an unbiased anticipation for this adventure. 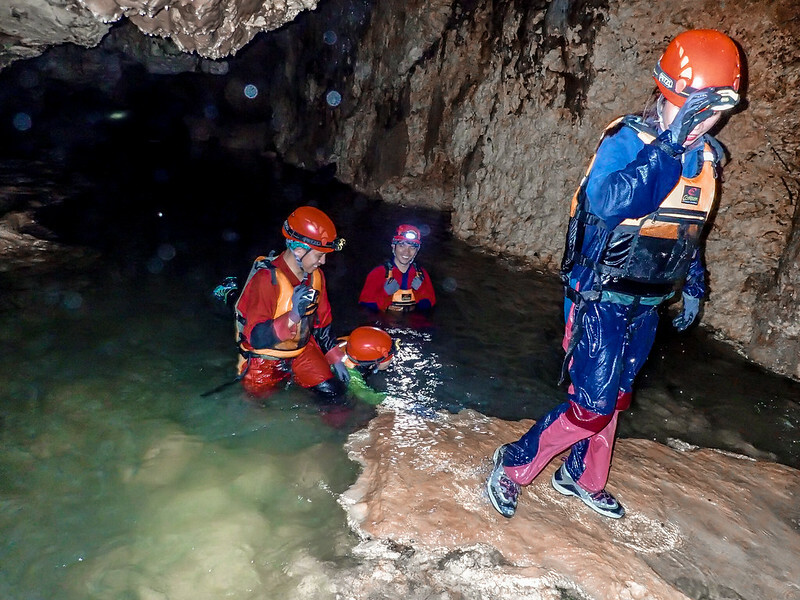 Overall suited up, gears on and orientation are done, we stepped into the darkness once again. 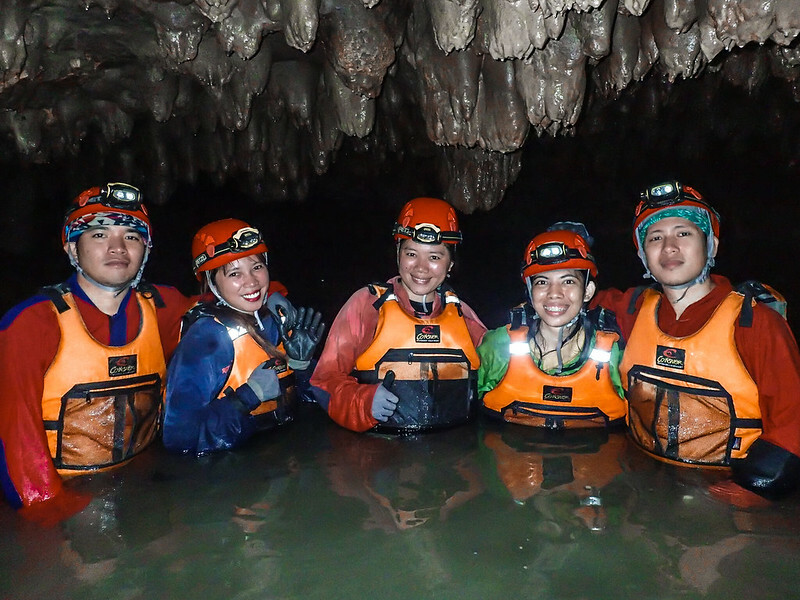 As soon as the sun’s light disappeared, the wonders of Lobo Cave unraveled before our eyes as our headlamps gave us finite light through the caverns below the surface. The foul stench of bat feces and piss saturated the damp air. 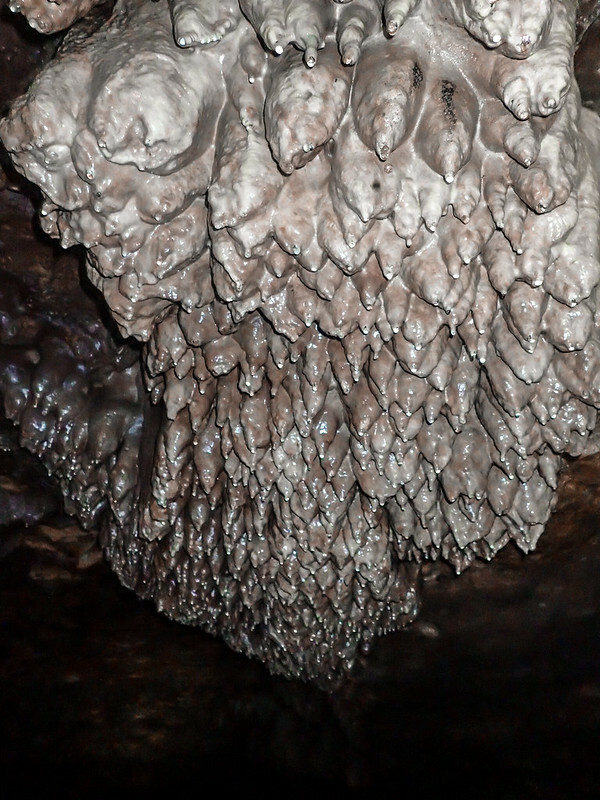 Varying sizes of speleothems decorated the low ceilings of the caverns and the cave floors. We docked and almost crawled our way in. 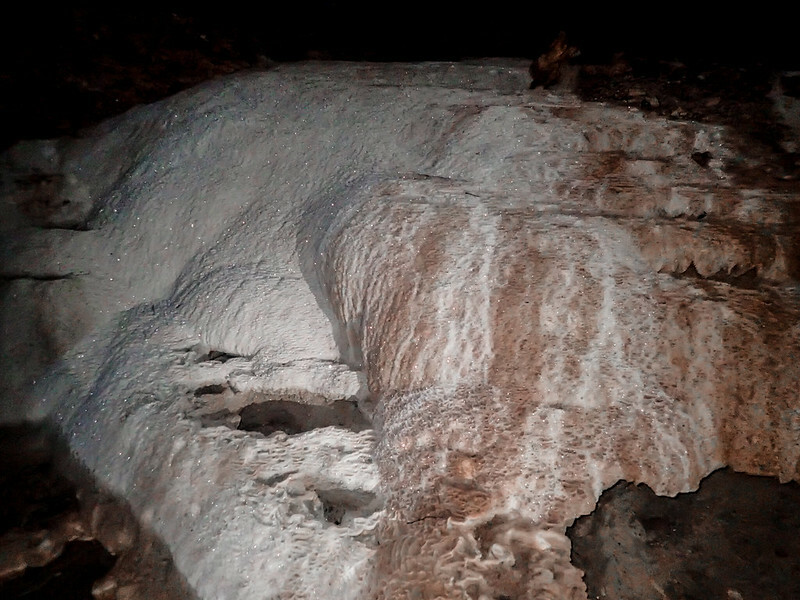 Among these geological wonders we encountered were a bed of cave pearls polished through time and nature’s caress and some are even scattered on the way. 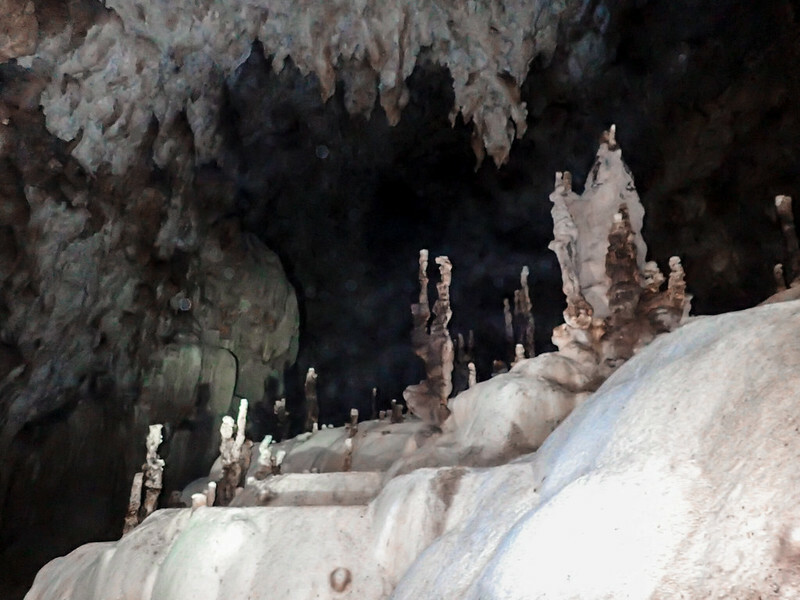 Bats and swifts were hovering above our heads when we reached the main chamber of Lobo Cave. 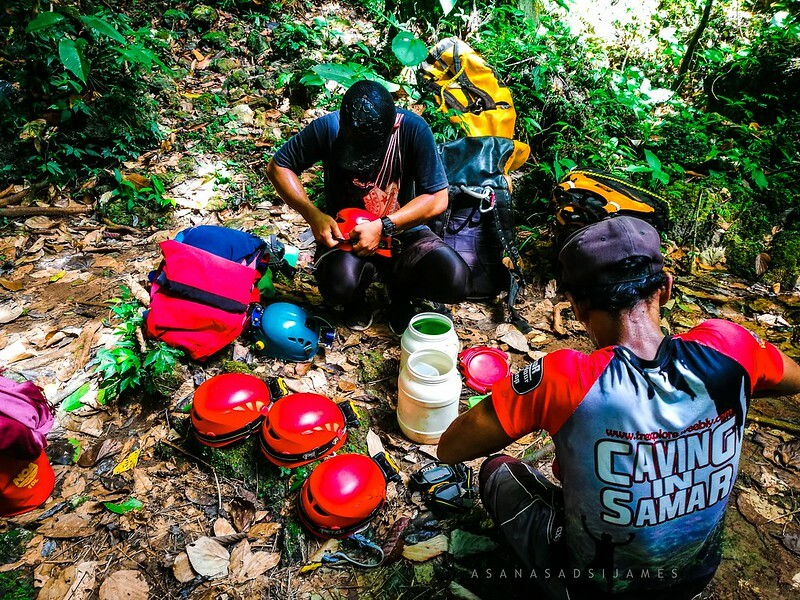 Unlike the Langun-Gobingob Cave, Lobo Cave’s main chamber isn’t as high as a skyscraper nor as vast as a football field but living up to its name as the most beautiful cave in Samar, it boasts of numerous spectacular rock formations that are most impressive than in Langun-Gobingob Cave. 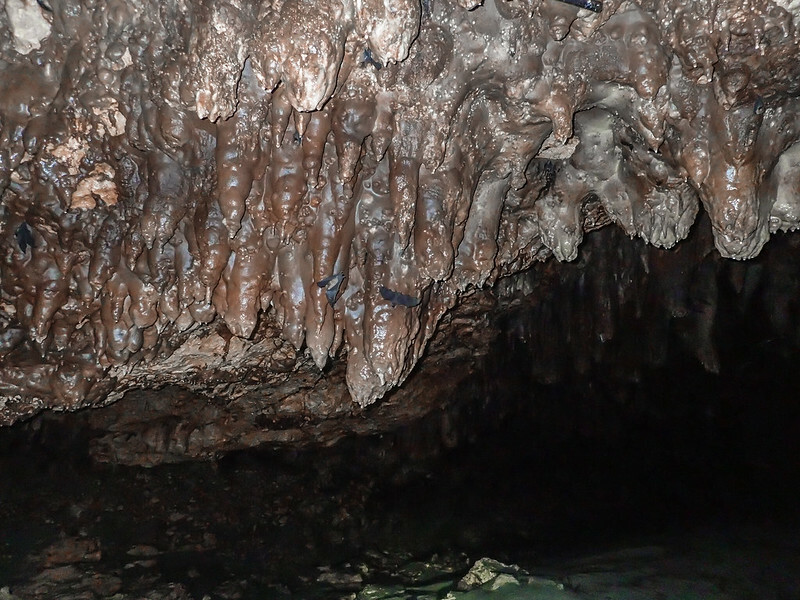 The main chamber also acts up as a hub to various caverns in Lobo Cave’s caving system. Thus, the chamber to chambers. 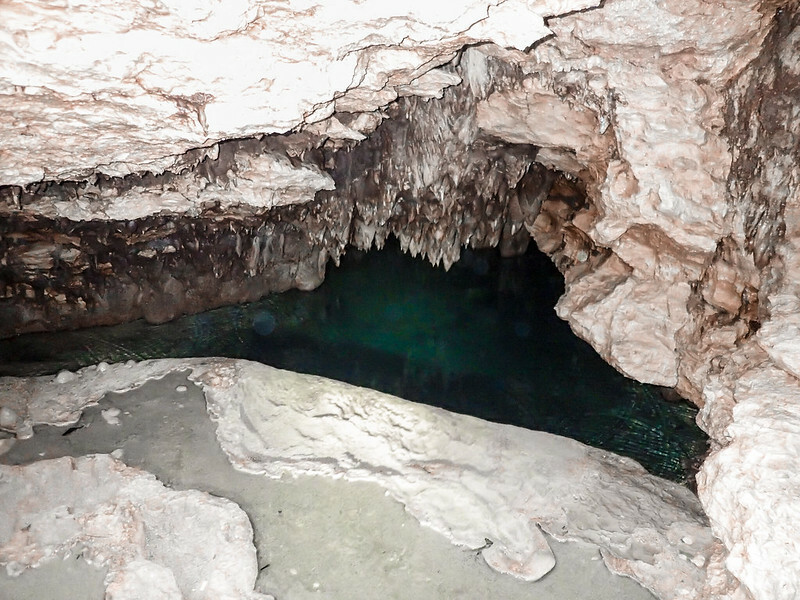 One cavern leads to this dead-end chamber where a mythological rock formation lies quietly and waiting for its curious visitors from the surface. 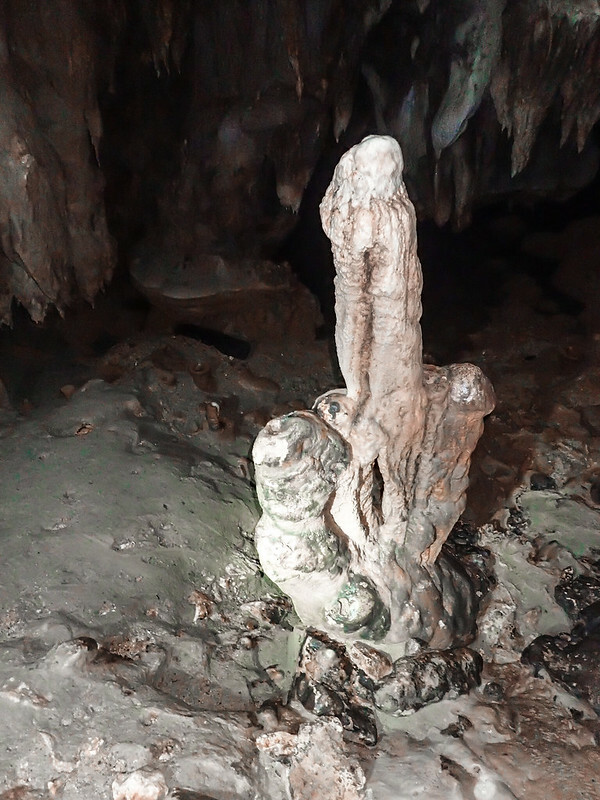 A huge stalagmite cloaked with glittering white crystals stands at the center of the chamber with wide feather-like flowstone joined on both sides resembles a heavenly being that seems silently guarding the chamber itself. 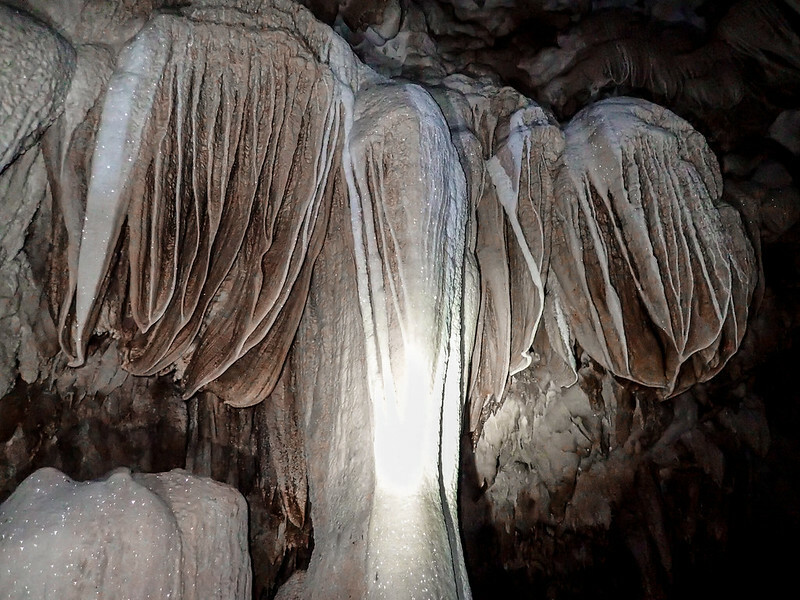 Sir Joni called this ethereal rock formation “Angel Wings”. 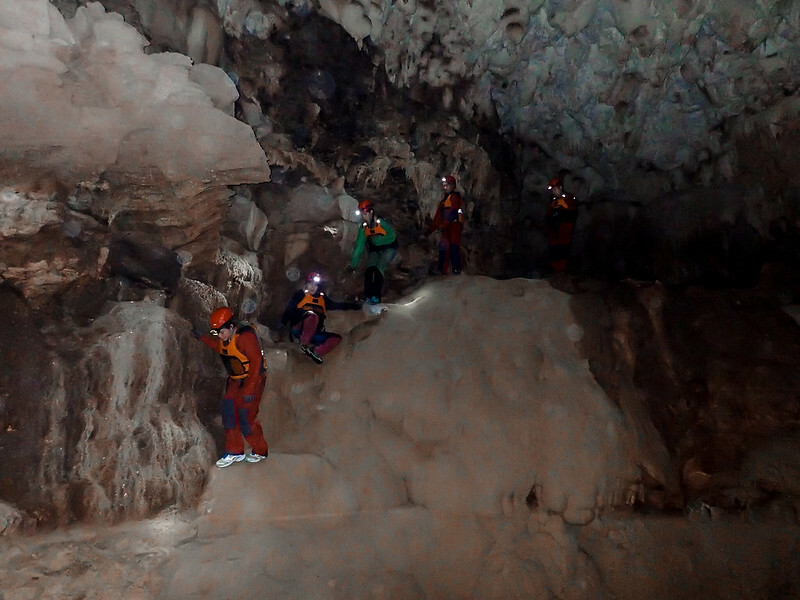 Heaven as I called this chamber because everything around is white and shining wherever our headlamps touched. We were all stuck in awe and wonder. 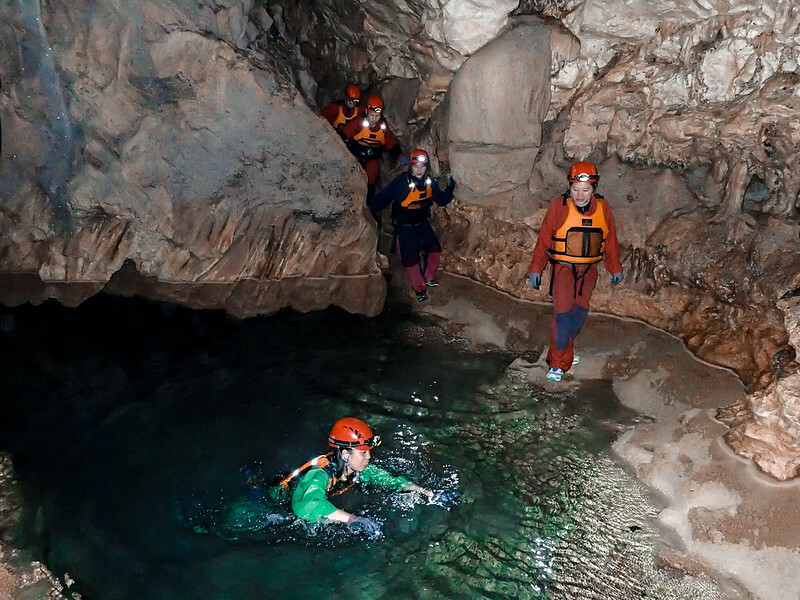 In another cavern leads us to this narrow steep-walled natural waterway. 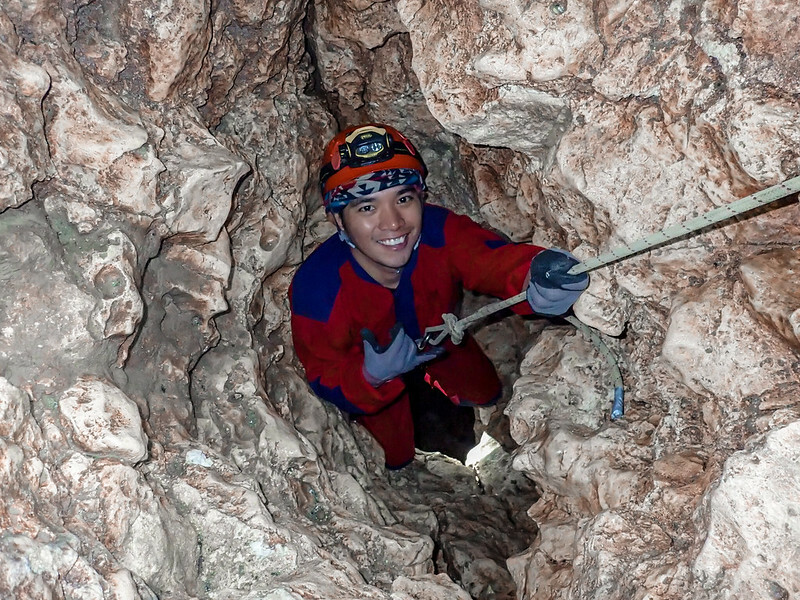 We’ve reached the so-called “The Grand Canyon of Lobo Cave”. 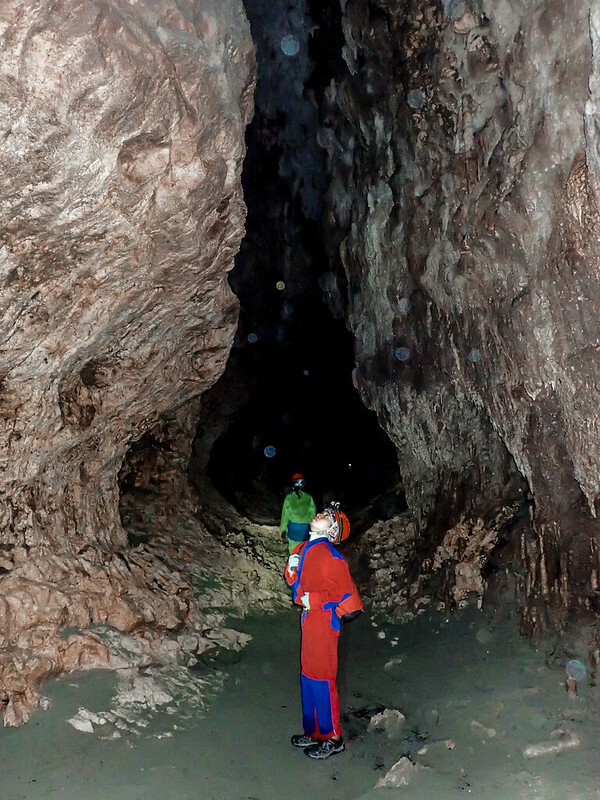 The gap between its walls are not more than 3 meters wide and the ceilings are so high that our headlamps barely touched up high. 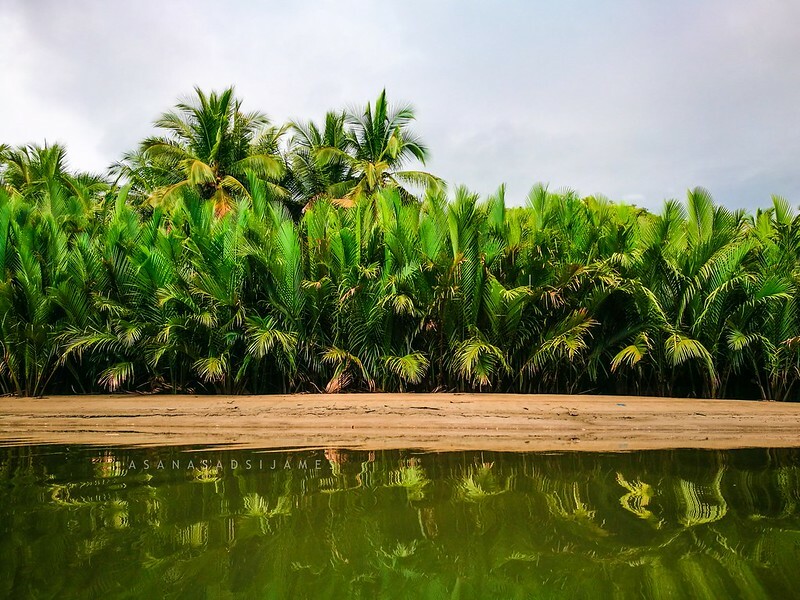 We walked on a sandy trail and discovered several natural pools along the way. 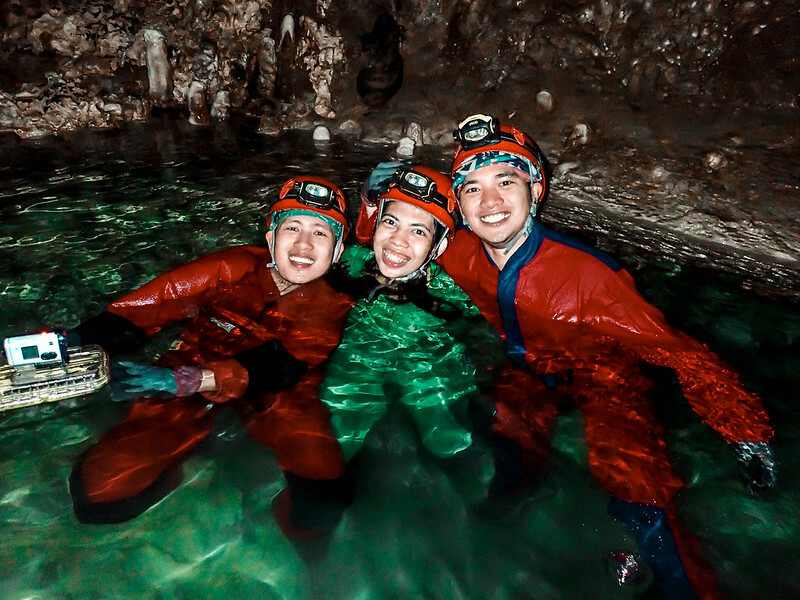 After almost an hour of exploring the caverns of Lobo Cave, we couldn’t help but to take a few plunges into these pools and cool our exhausted bodies a little. 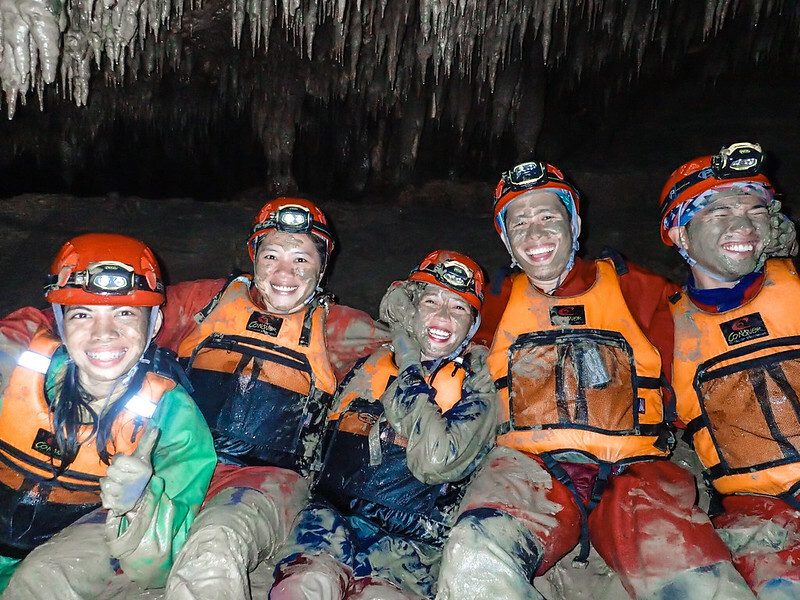 Our soaked cave suits felt a little heavier than usual but it’s still manageable to walk through the underground crevices and jagged trails of Lobo Cave. 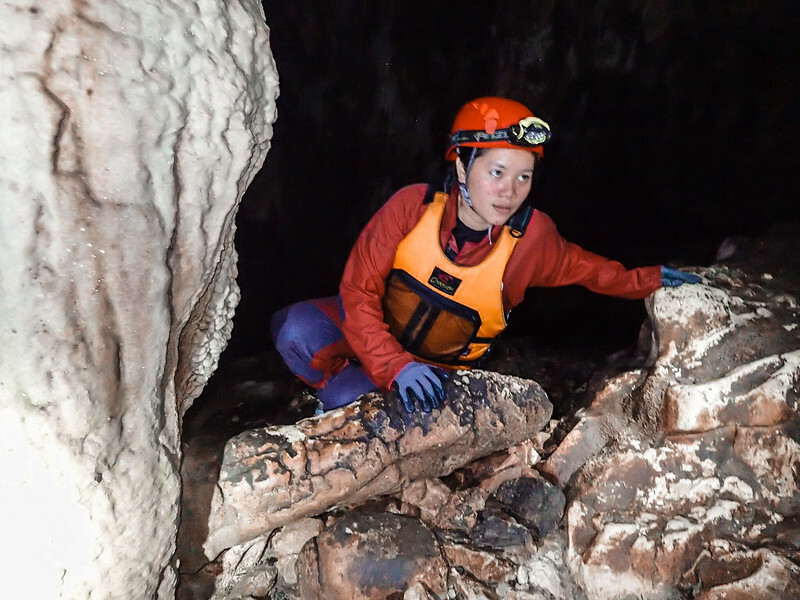 As we were getting deeper into the cave, the sound of the gushing waters got louder and louder but there are no signs of a river or stream. 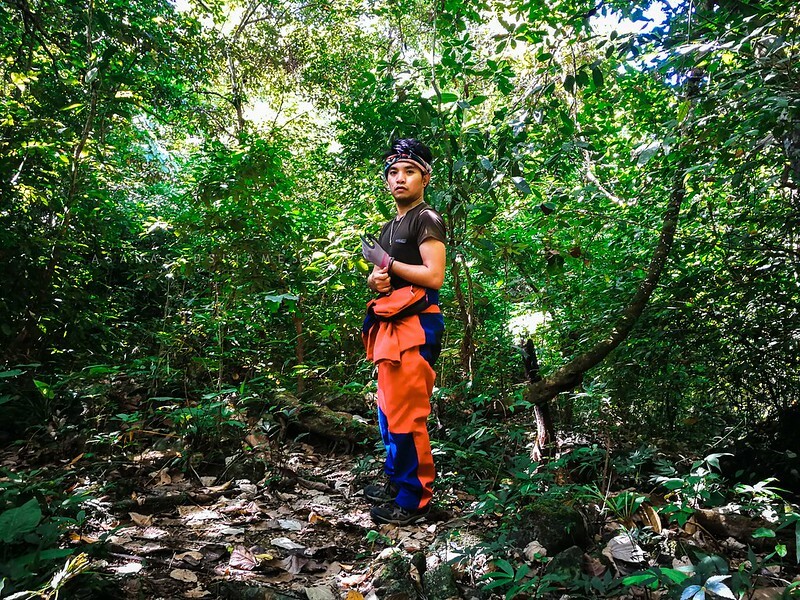 Still, the exploration continued until we stopped where one of our guides was preparing ropes and carabiners for rappelling. Along with this dried-up waterway is a human-fit rabbit hole that leads the way down to where the gushing sounds are coming from. 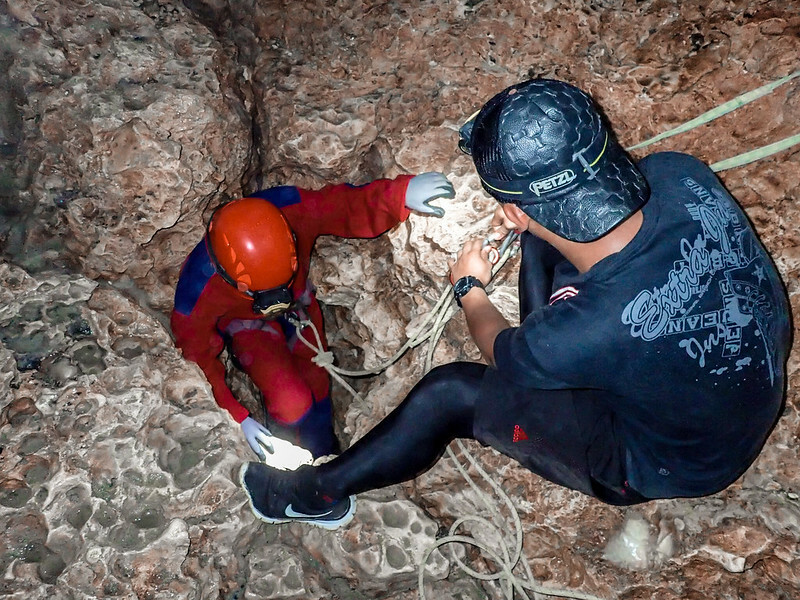 One by one, we carefully rappelled down through these tiny crevices of the rocks and then secured a safe spot in a chamber while waiting for the whole team of explorers to regroup. 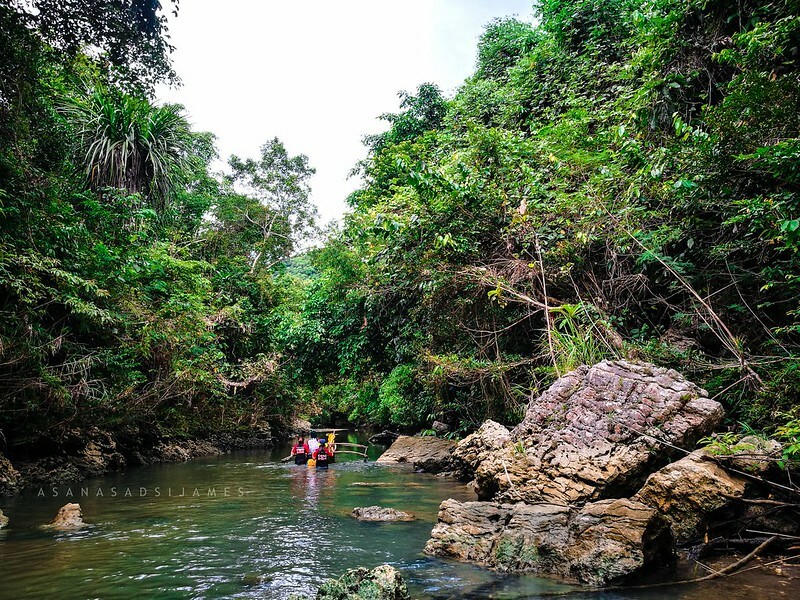 The atmosphere down here is more moist and colder and the gushing sound of the waters was at its loudest. From where I sit, I can feel the cold damp air brushing against my face. I can even see my breath fogging with every moist of the air. Inside the chamber was a hill of boulders and sand, and a whole lot of washed up logs and leaves. Down below is a river sandbar floating above the water. 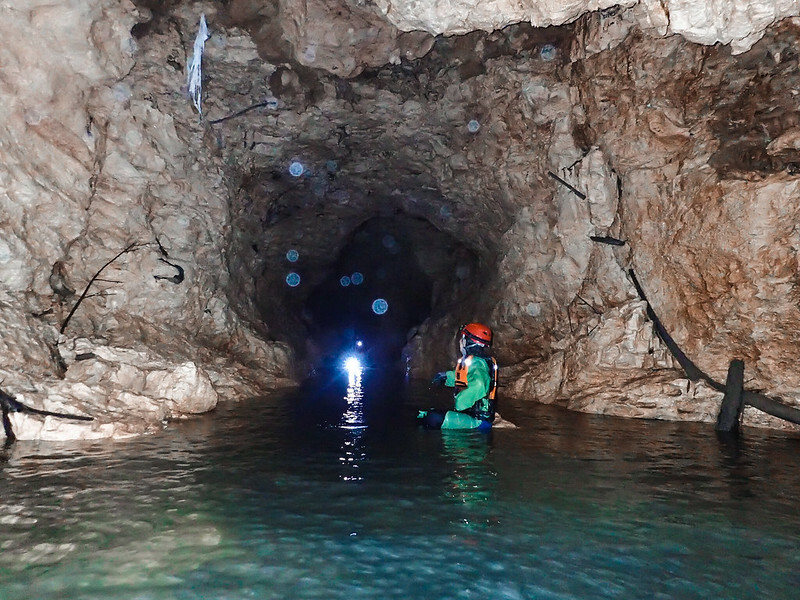 As an avid water baby, I got excited when I think of exploring this underground waterworld. 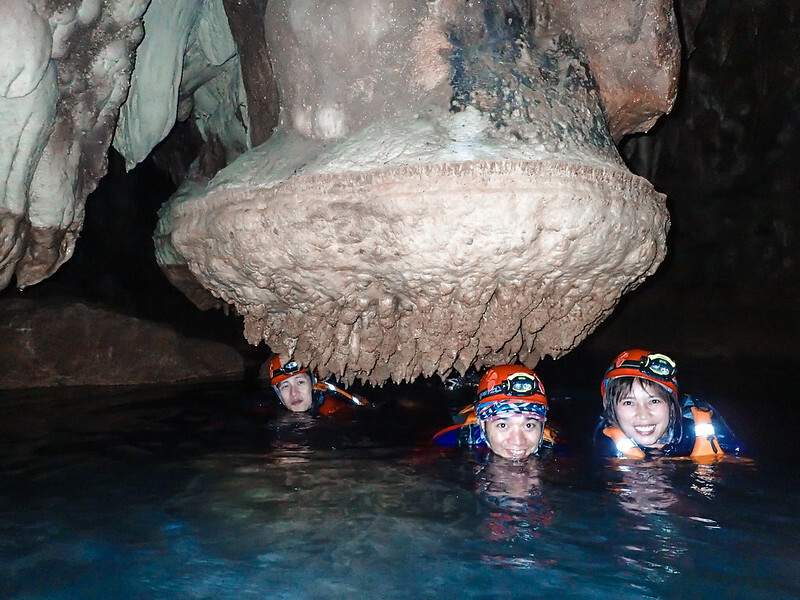 They said that the presence of water system inside a cave is an indication that the certain cave is alive. 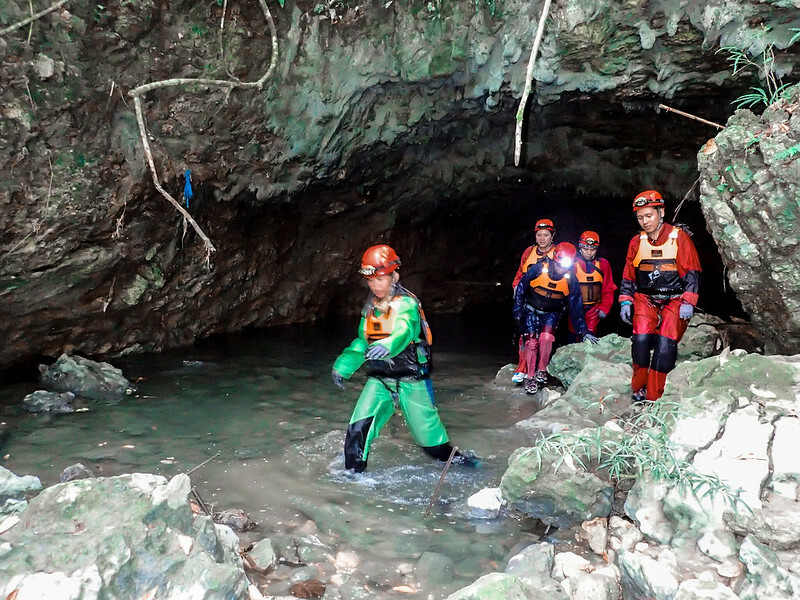 But in the case of those brave explorers, it is never favorable for having water inside a cave. Harm and danger come along for those who wished to explore inside. 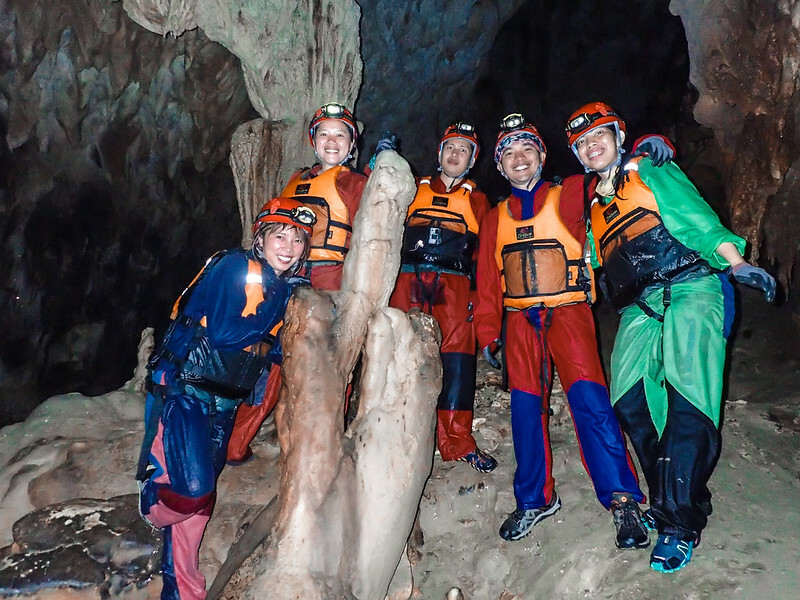 That’s why one should coordinate with cave experts like the Trexplore The Adventures. 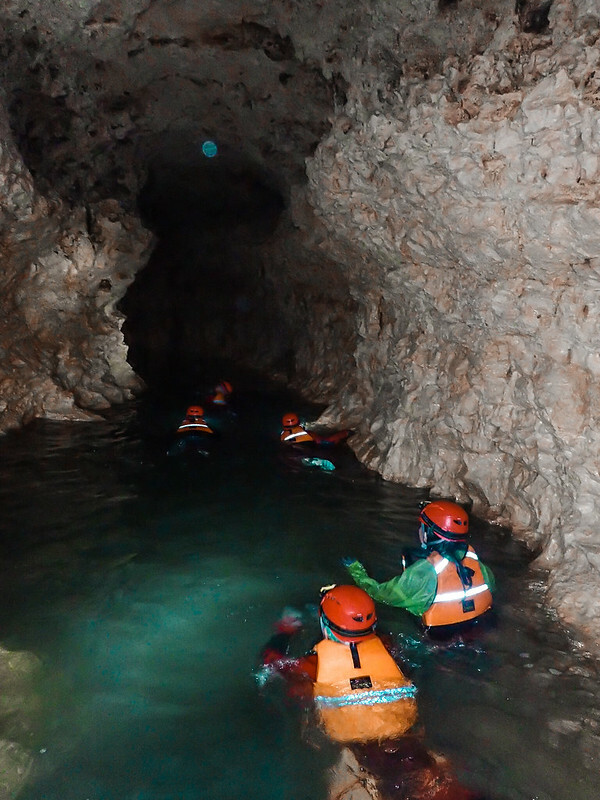 As soon as the whole team had rappeled down, we then prepared our safety vests for swimming through these canyons. 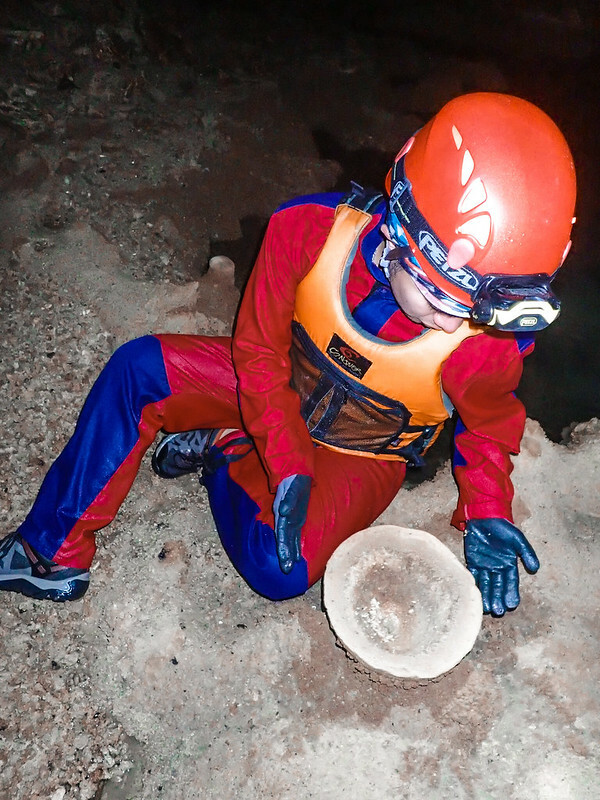 Despite everyone being good swimmers, safety vests are still essential in exploring these canyons and rivers. 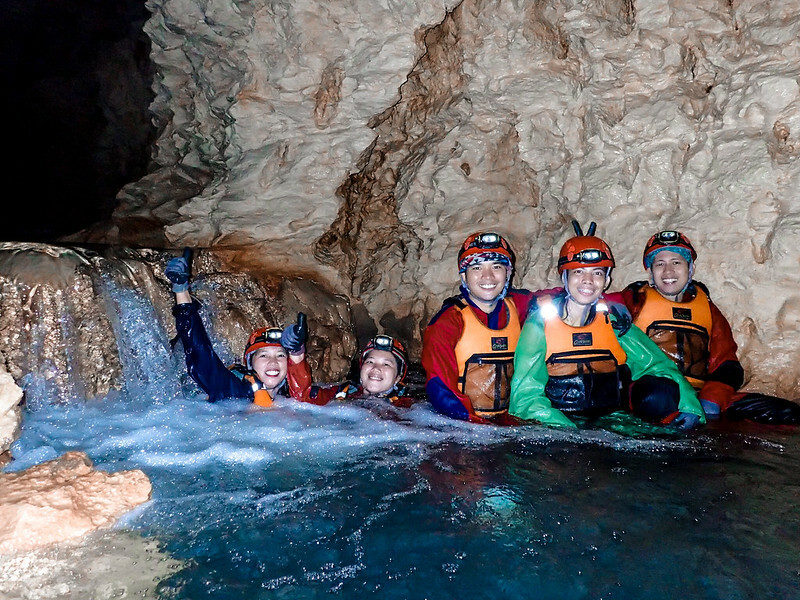 With our safety vests on, we commenced our 2-hour laborious hiking and swimming in these canyons. We approached near where the gushing sounds of water are coming from. A cascade of waterfalls fascinated me and my friends. It was surrounded by glittering rocks of same kinds bath in cold waters. 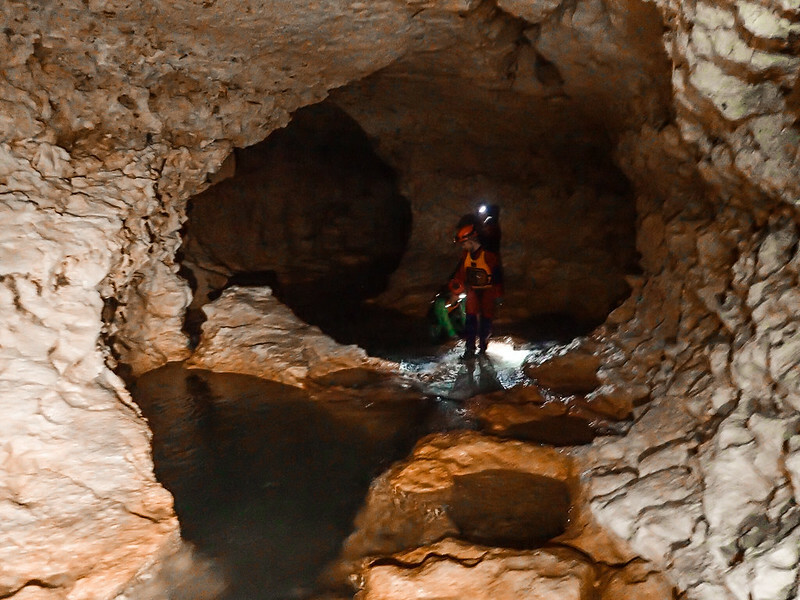 That was the most beautiful underground waterfalls I’ve seen so far. 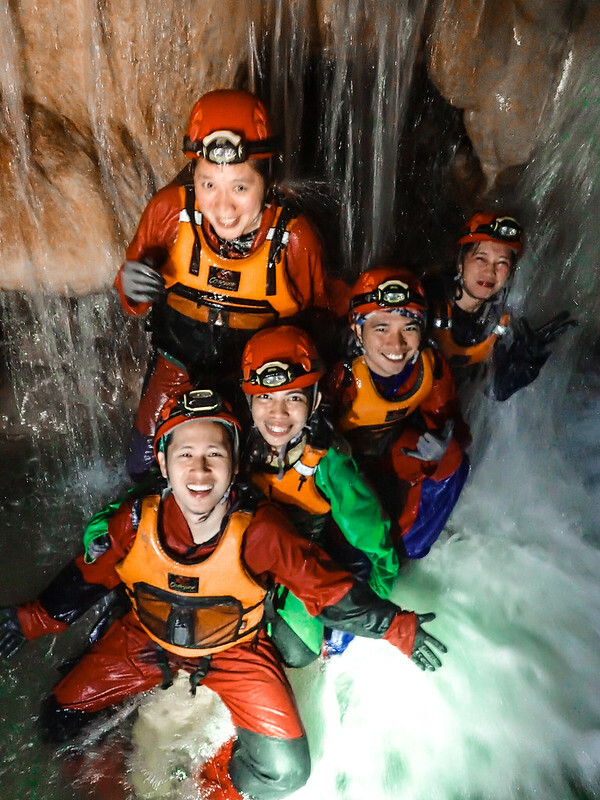 The adventure soul inside of me is as excited as the waters jumping off of the waterfalls. We followed the canyons upstream. 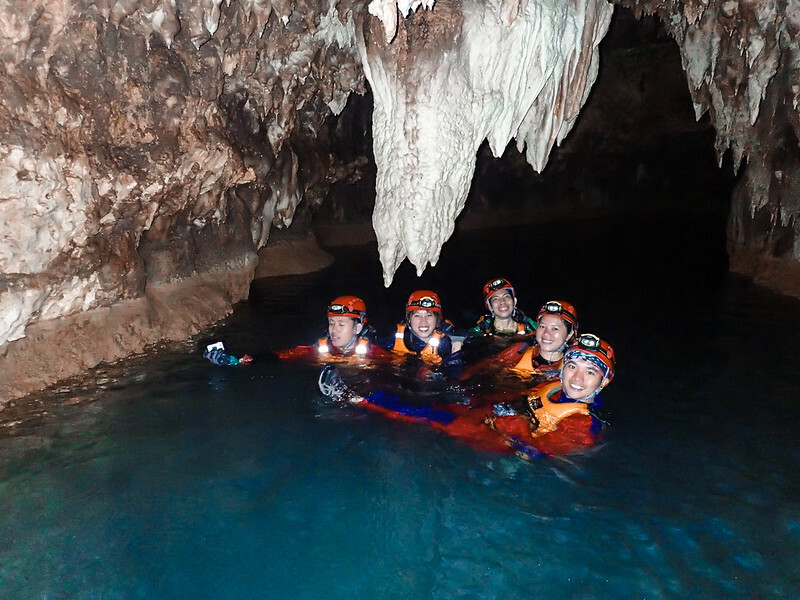 We started off by hiking, jumping, and swimming through the underground canyons and pools. 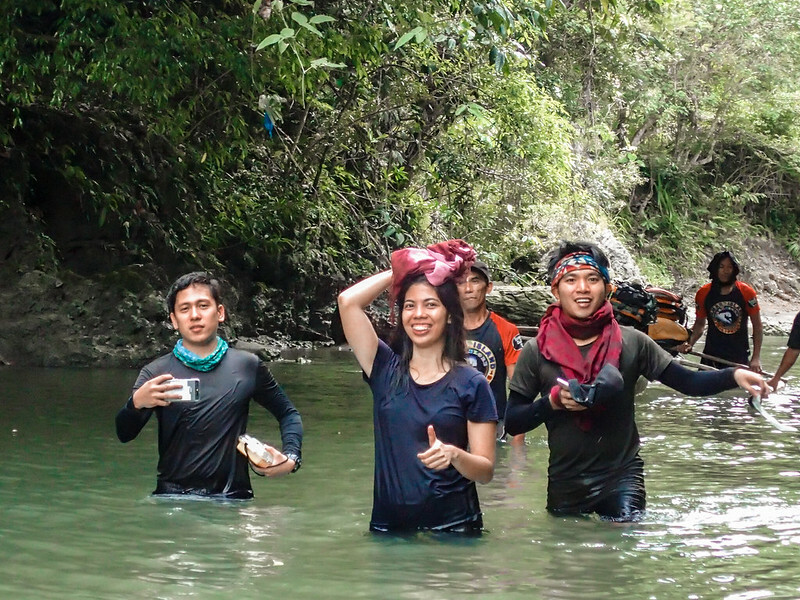 It started up a little laborious activity but thanks to the cold waters that acted as a cooling element to our bodies. 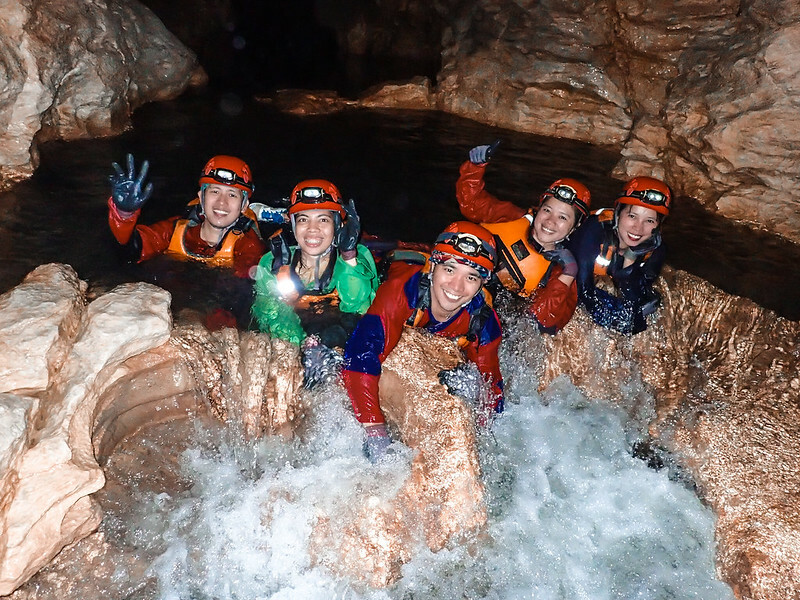 We swam against the water currents along the tunnels where the stalactites can be reached by your hands on the canyon’s ceiling. I was in bliss during this exploration. 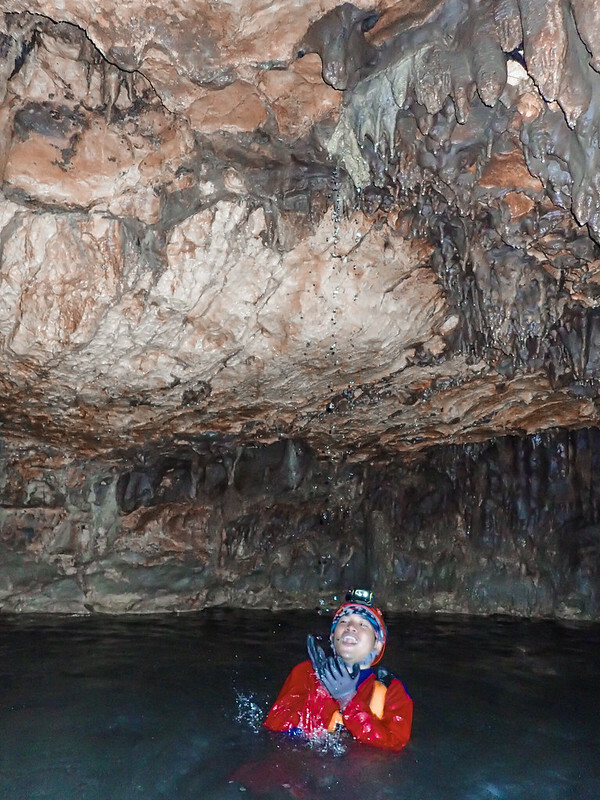 Swimming and frolicking in the dark waters inside this cave is never a hassle for me but a pure adventure. 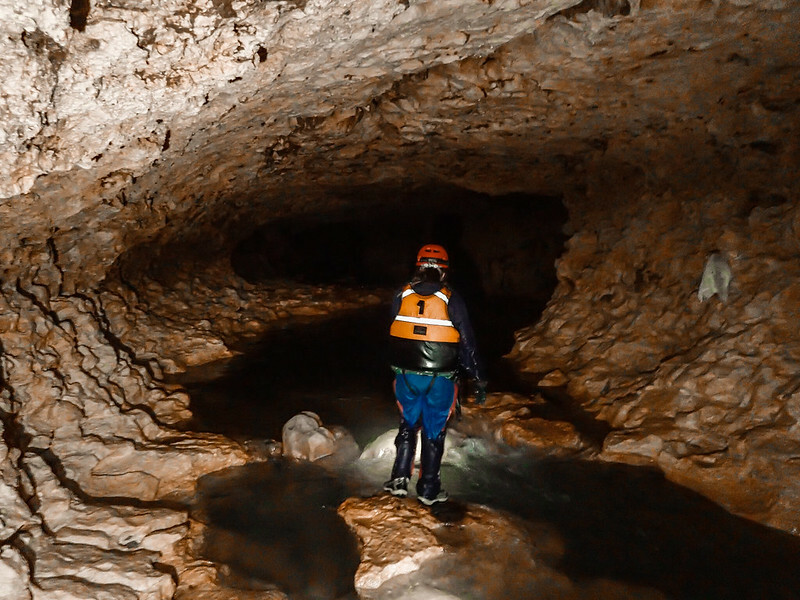 These narrow tunnels seem like manually labored and carved by humans but the truth is, it has been shaped by strong and constant currents over thousands of years. It really is a wonderful masterpiece of Mother Nature. The slow flowing of current washed off our exhaustion as we clawed onto sharp rocks. Boredom never took over the atmosphere with these buddies with me. 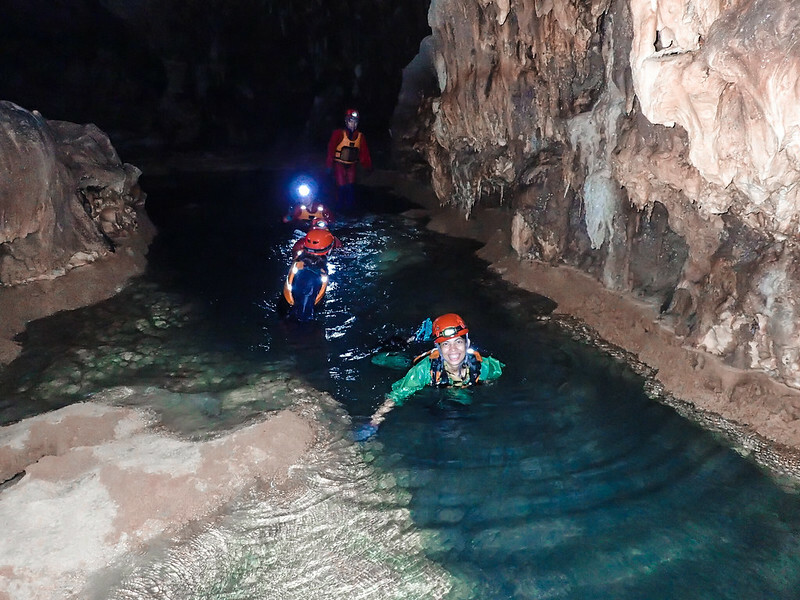 After an hour of marveling and fascination, we reached the dead end on a deep pool where cave divers can access through underwater tunnels. Sadly, this is the end for us and we headed back downstream. 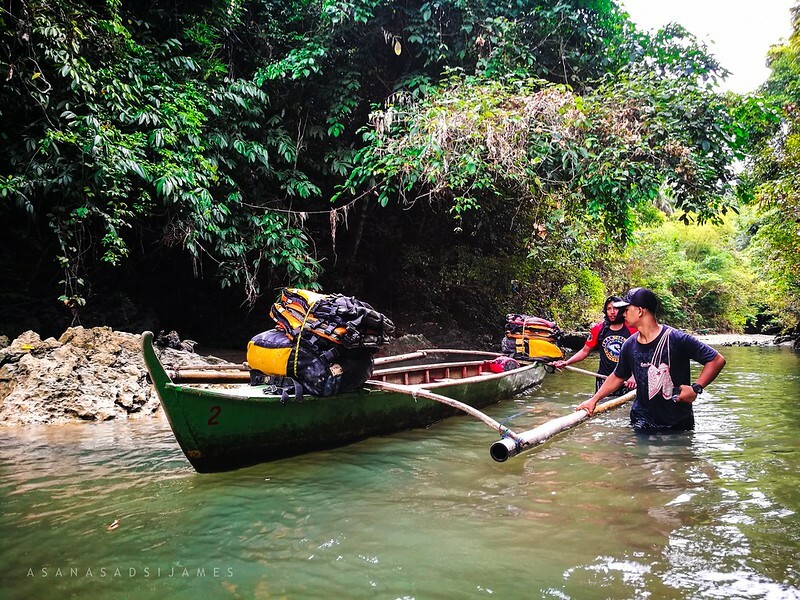 On our way back downstream, sir Joni led us to this bizarre chamber of dirt and mud. 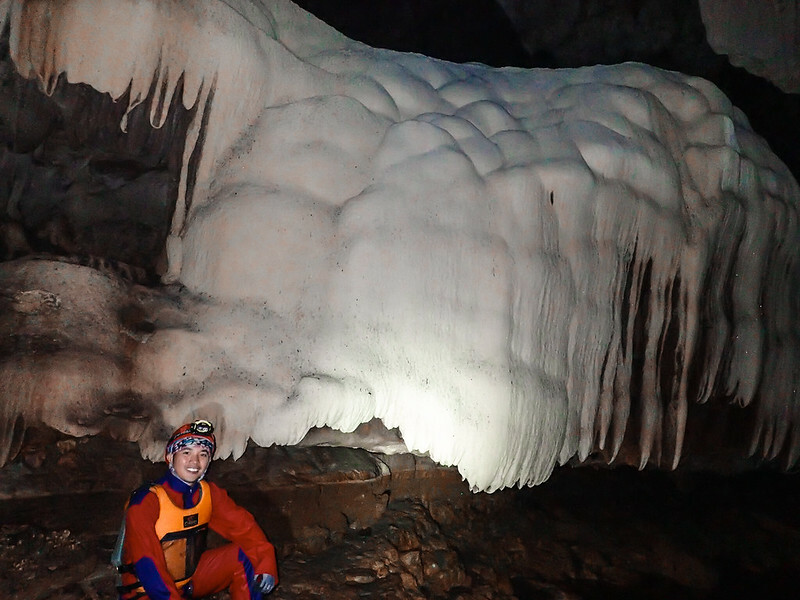 On its low ceilings are some baby stalactites that are about to be as huge as the ones we usually see inside a cave but after thousands of years of course. 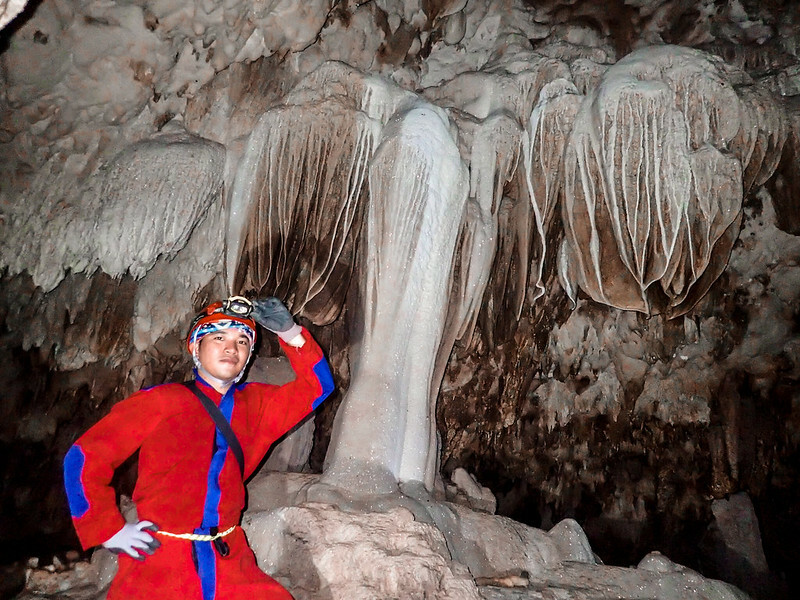 These stalactites are called soda straws; resembling from its appearance to a straw. They’re so delicate that a light brush on it could potentially destroy a thousand years worth of treasure. 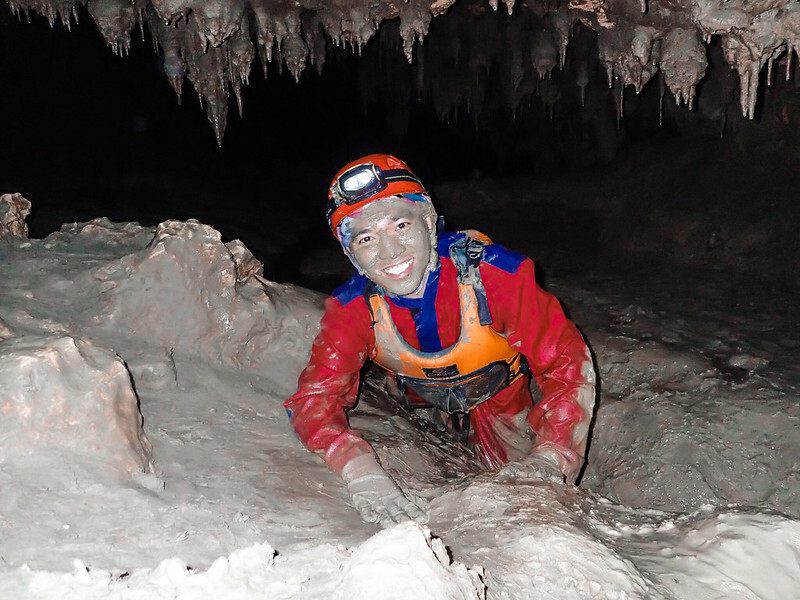 We carefully crawled our way inside the mud chamber. 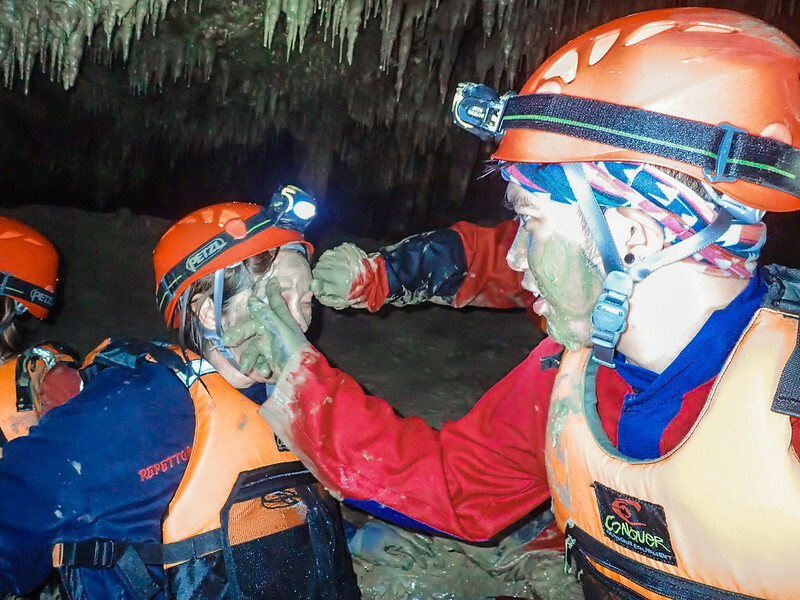 The muds are so soft and squishy to touch even with our gloves on. 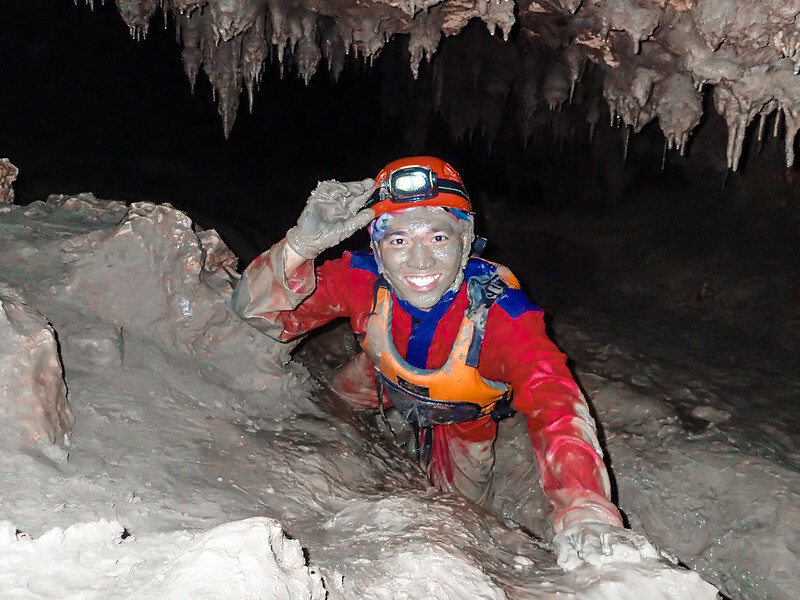 As per sir Joni, the mud in this chamber have healing properties and are good for the skin. After hearing those words, we friskily rolled and smeared our faces with mud like we were still children playing on the dirt. 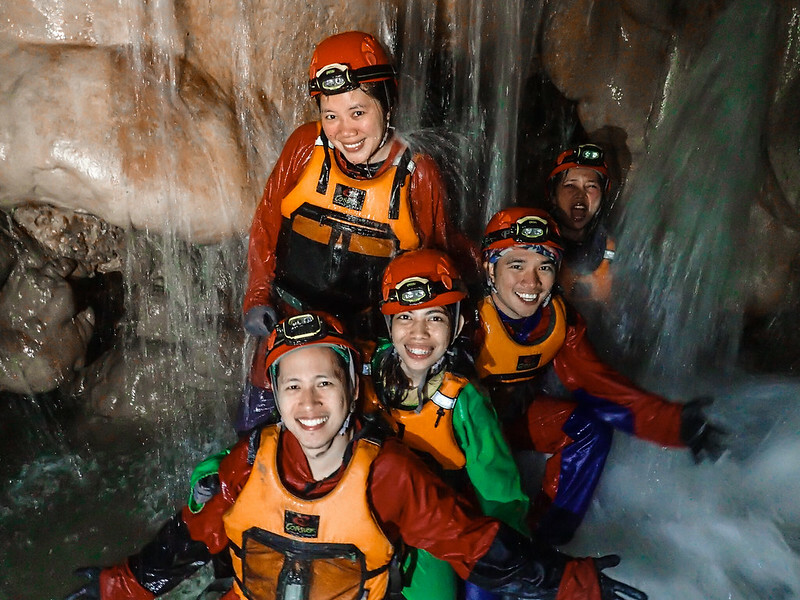 Our laughter and giggles can be heard throughout the whole canyons as we’re playing with the mud. 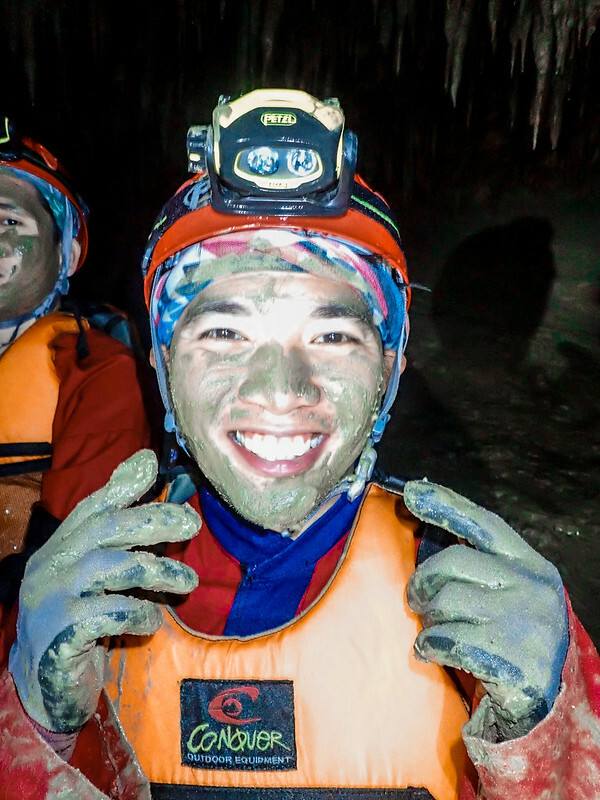 All our faces were covered with mud, as well as our cave suits. As my teacher in elementary said, “The most memorable days usually end with the dirtiest clothes.” And that my friend certainly earned a page on my book. 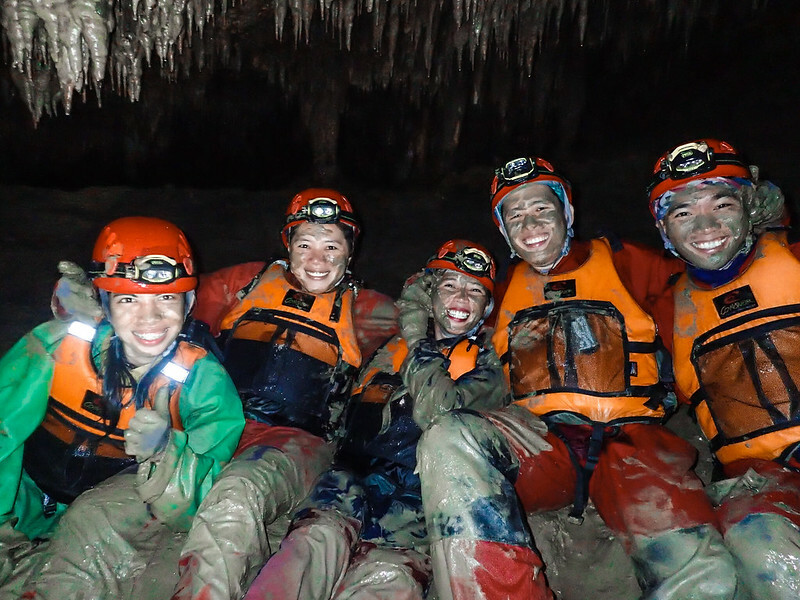 Moments later, we headed back to the river to wash off the mud and dirt on our faces and cave suits. 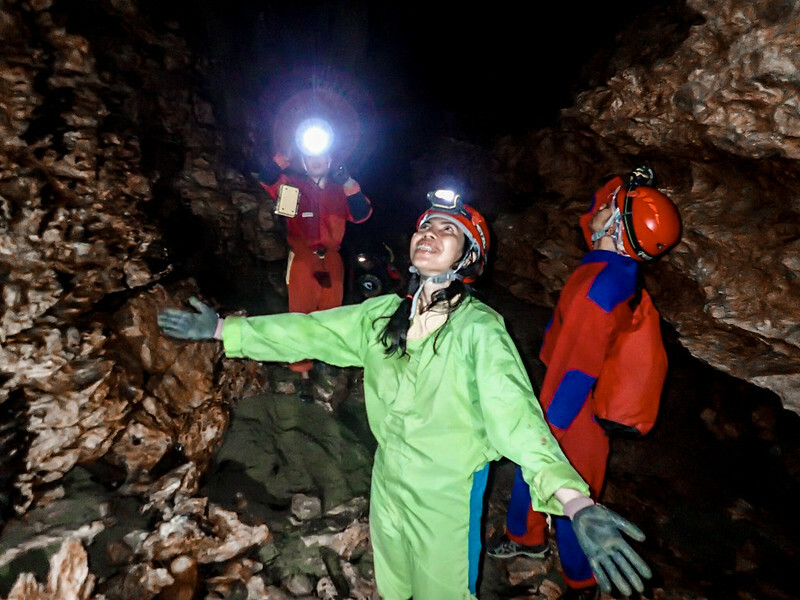 Through the dark tunnels and finite light we had, we still enjoy the activity to the fullest. We reached the waterfalls again and soaked our body for the last time. We took some time leaning on the rocks of the waterfalls to have that back massages by the cold waters rushing in. After clawing our way up on the rabbit hole, our lunch was already waiting for us. We had humba for our meal to regain our strength for the next activity. After a few gulps and burps, we commenced the last level of this activity. Up to the upper level, we go! 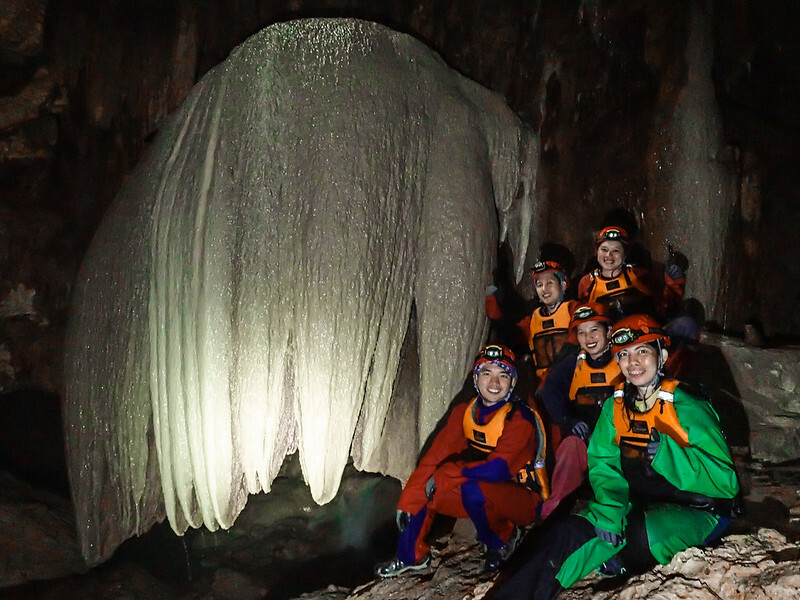 From the main chamber, sir Joni led us to another tunnel up full of massive glittering flowstones frozen in time hanging on every cave ceilings and walls. 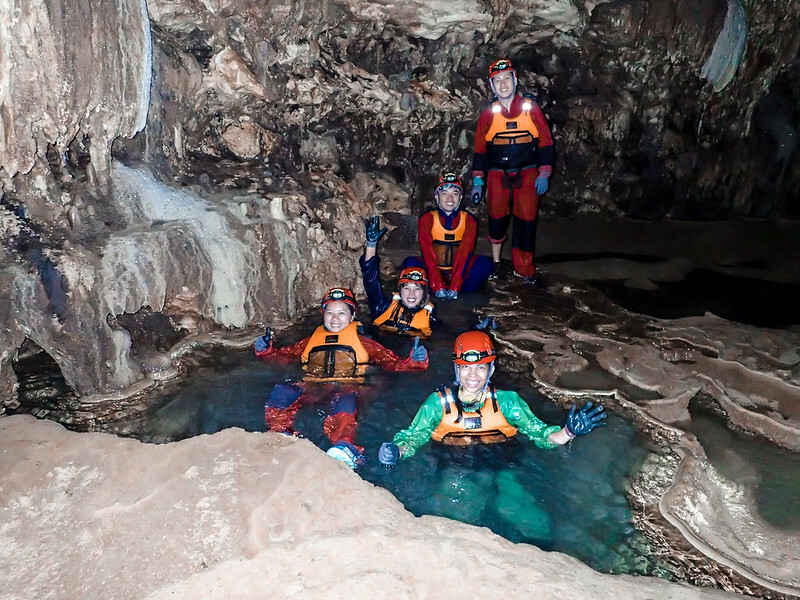 We climbed over some terraces to find numerous cave pools and waterways ahead. 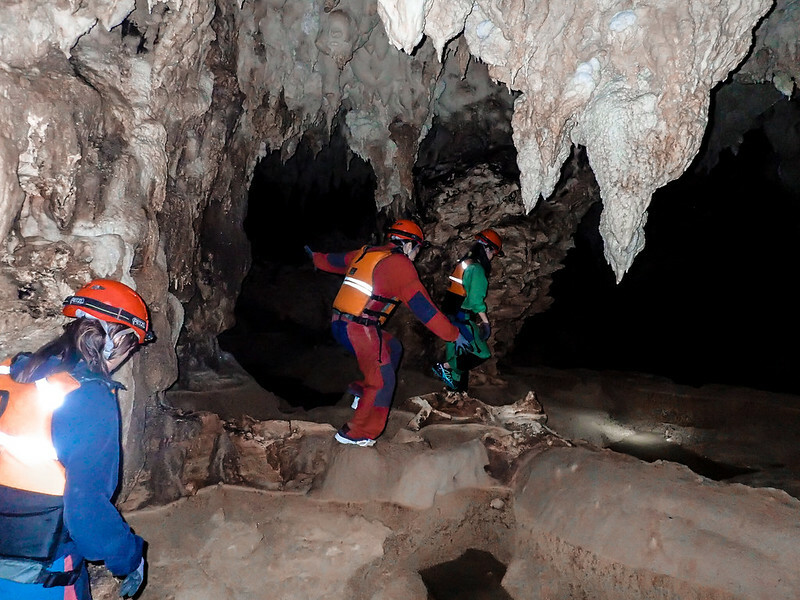 It never gave us a disappointment for this upper level holds the most beautiful collections of speleothems inside the Lobo Cave. 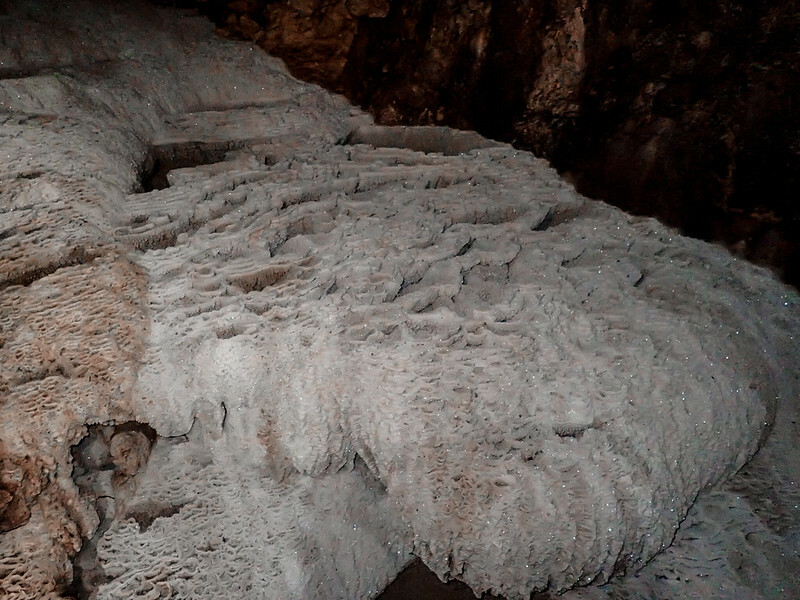 Along the uneven ground, we found some of the strangest formations of speleothems lying on the floor. Some of it can be expressed in an explicit and vulgar way if you have a wild imagination to comprehend its structures. 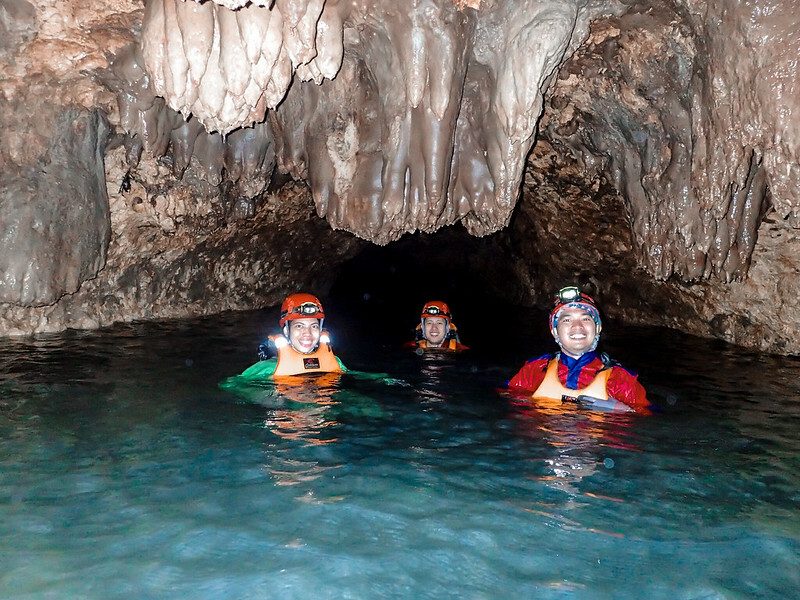 Nonetheless, they’re still the wonders of Lobo Cave that needs to be protected for future generations and for the preservation of this beautiful cave. 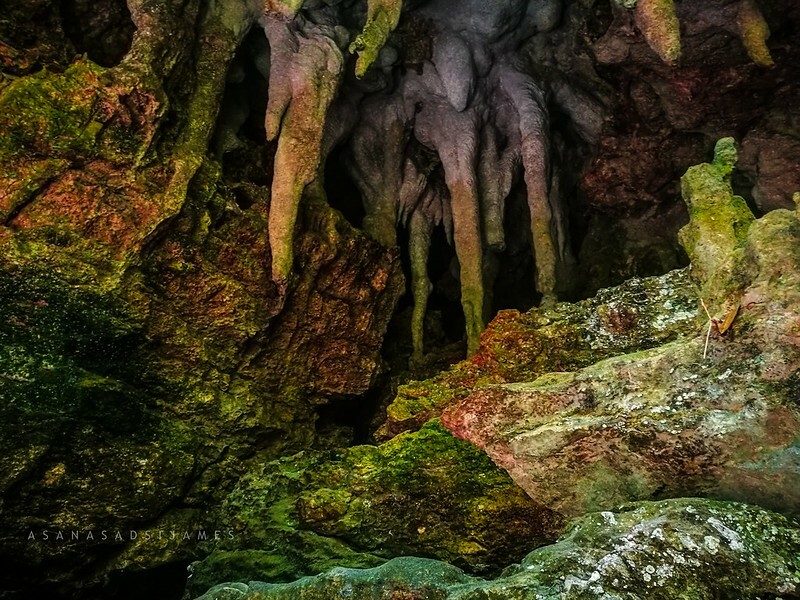 On some corners of the cave may find several flowstones that are like glittering icebergs trapped underground. 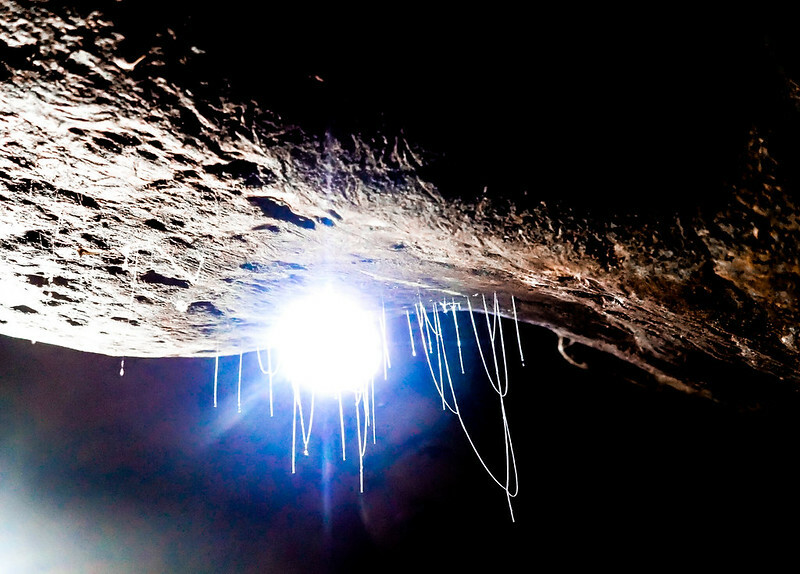 A chalice-like rock formation mostly decorated the cave floor and dozens of jellyfish-like chandelier stalactites are beautifully hanging on its ceilings. 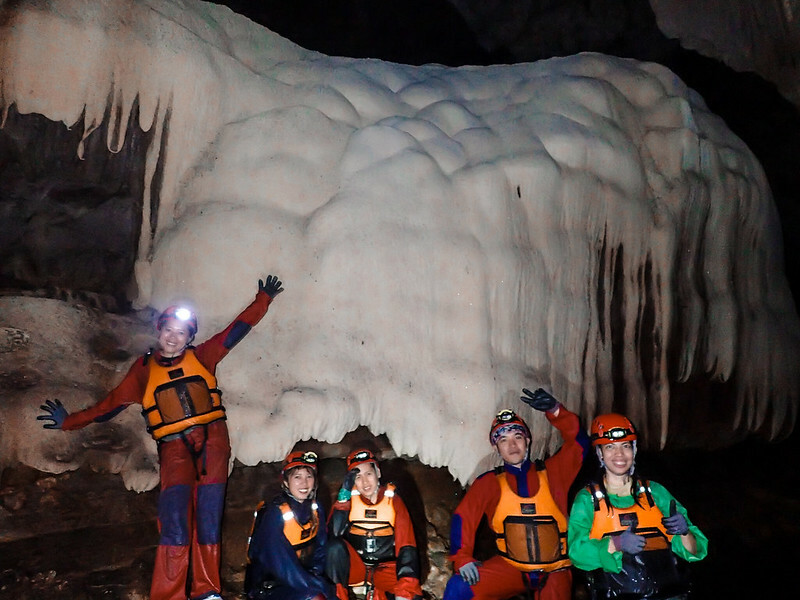 The waterways are donned with numerous uneven depths of cave pools of varying sizes and shapes. Cliche as may sound but the photos that have taken did not give justice to any of our eyes had laid. 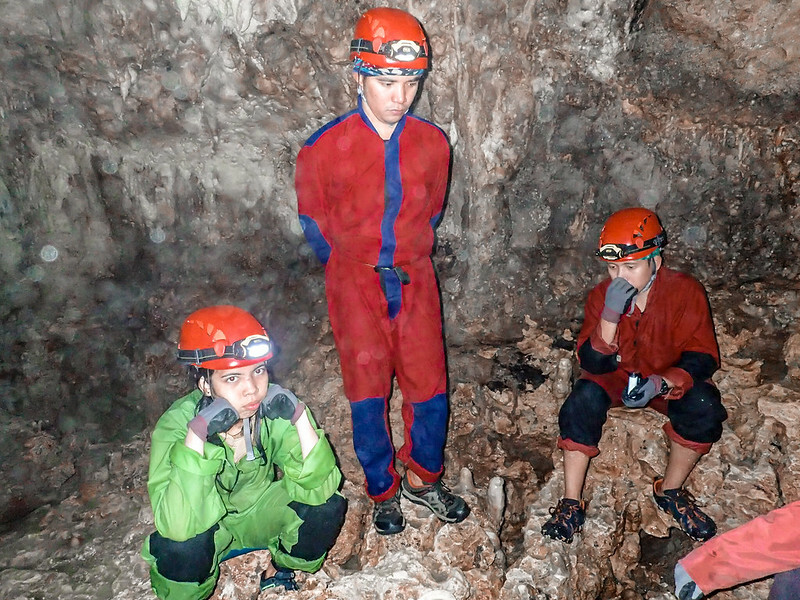 Also, we did not miss the different kinds of cave-crawlers and cave-dwellers inside but one of these creatures took the spotlight for its own. 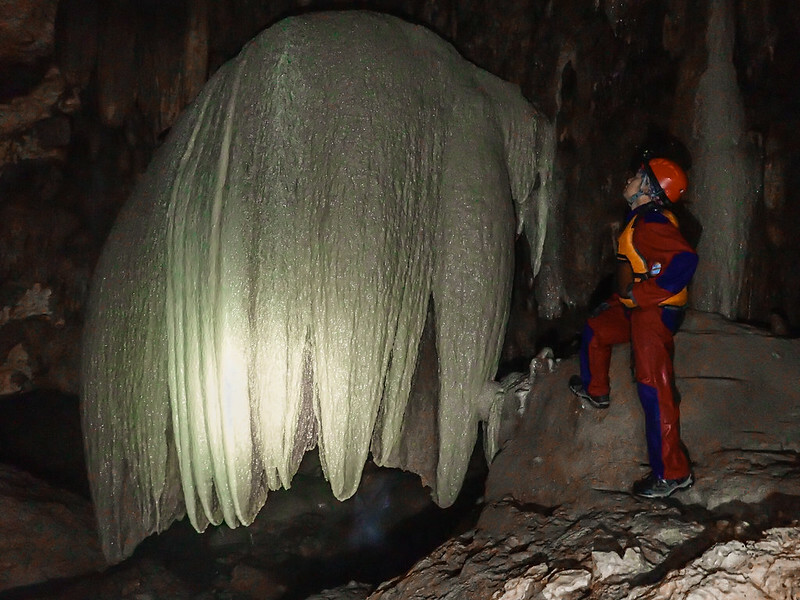 Sir Joni showed us a thread-like thing hanging cautiously on the cave walls of Lobo Cave. 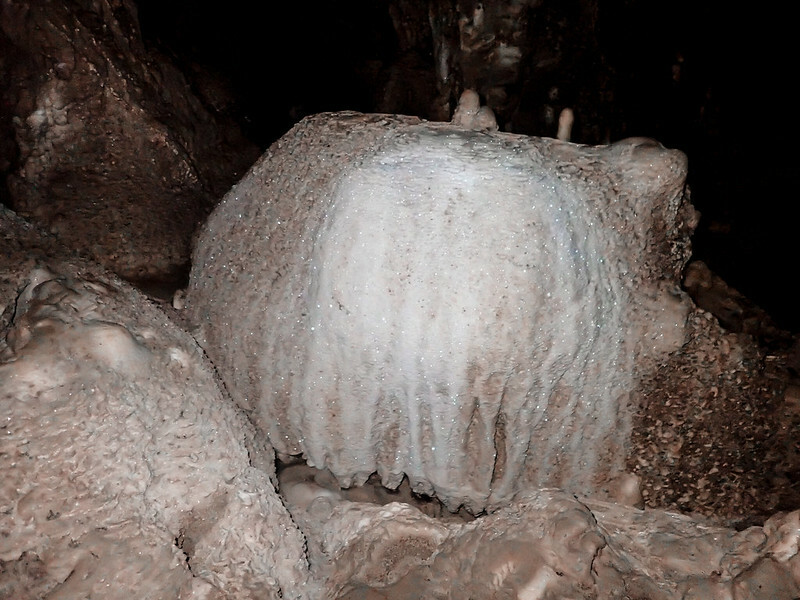 It’s a cave silkworm that was using its thread for hunting traps. 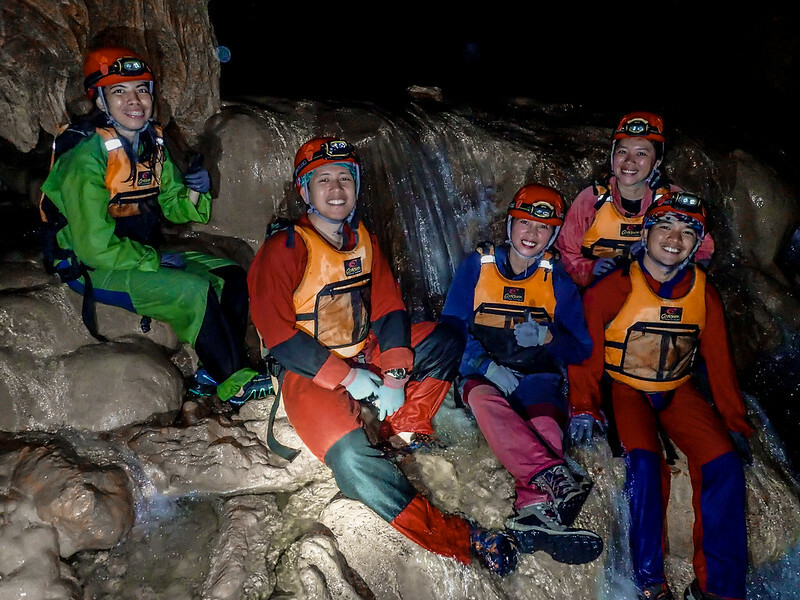 They’re similar to the famous glowworms found inside the caves of New Zealand. 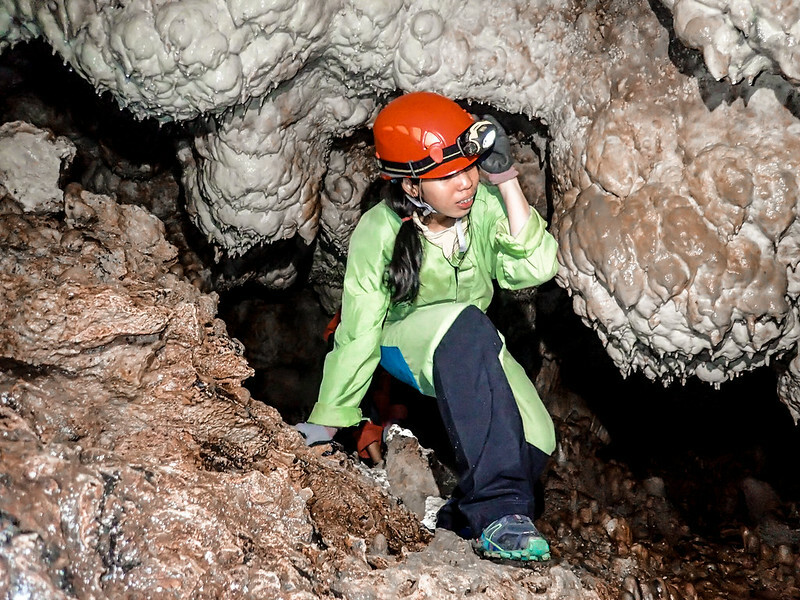 This journey seems like a field trip of both geology and zoology classes but on a different kind of level. 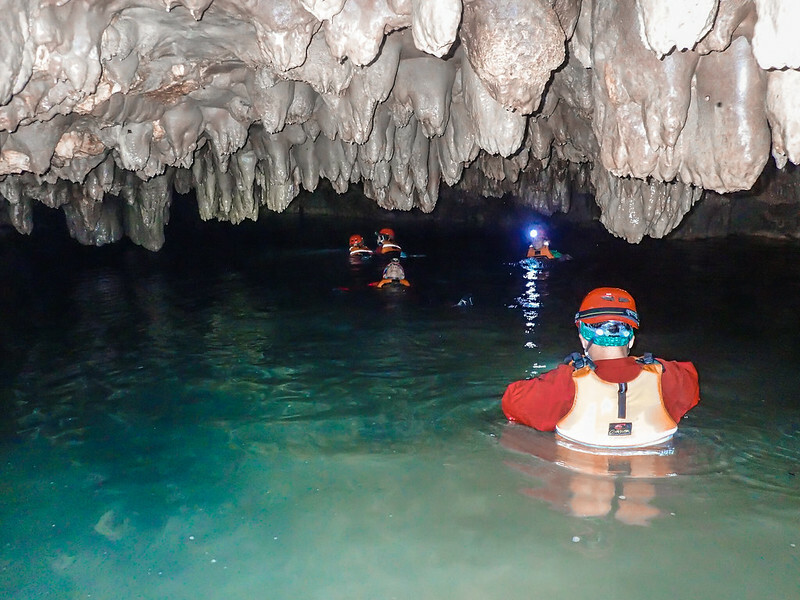 For nearly an hour of jumping and swimming on an uneven depths of cave pools and hiking jagged cave floor footholds, we’ve reached a point where us tourists end the exploration. The cave indeed is the most beautiful cave I’ve ever seen. 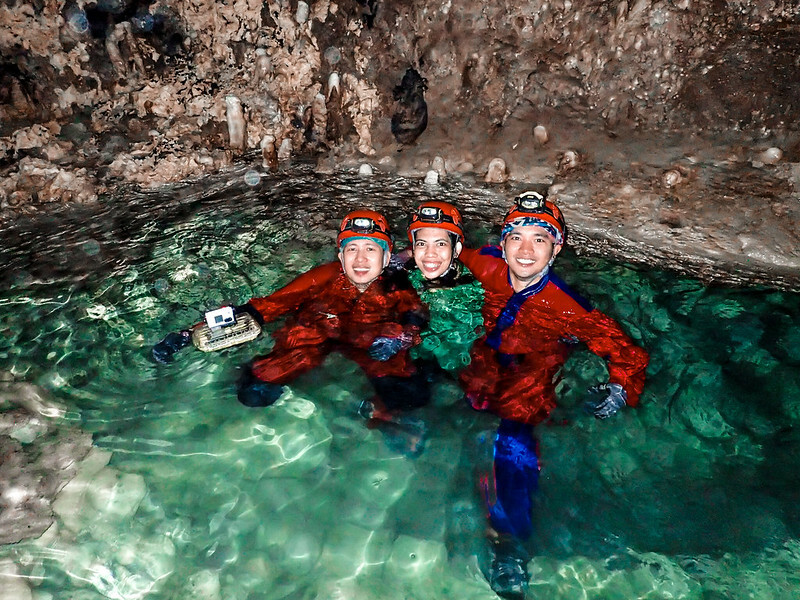 We went back to the main chamber and find our way to the exit. 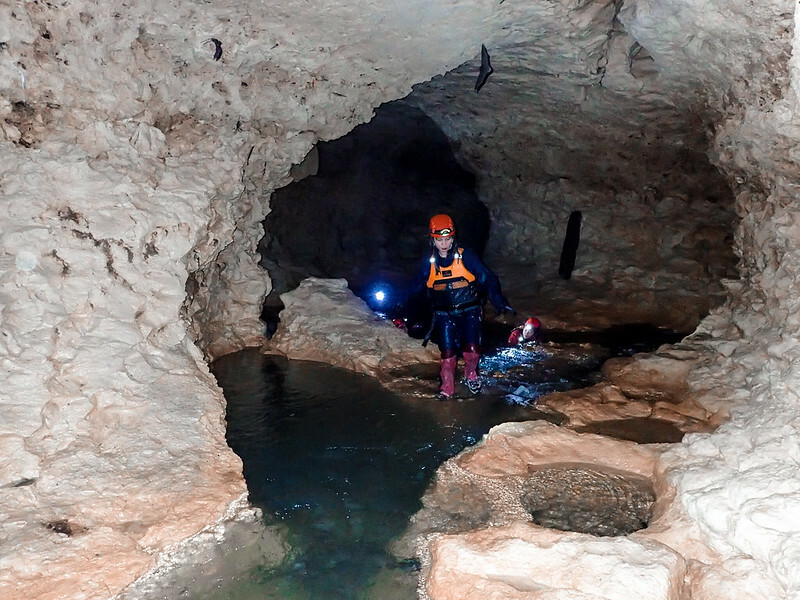 The last tunnel is composed of sandy trail similar to the waterway of the Grand Canyon. 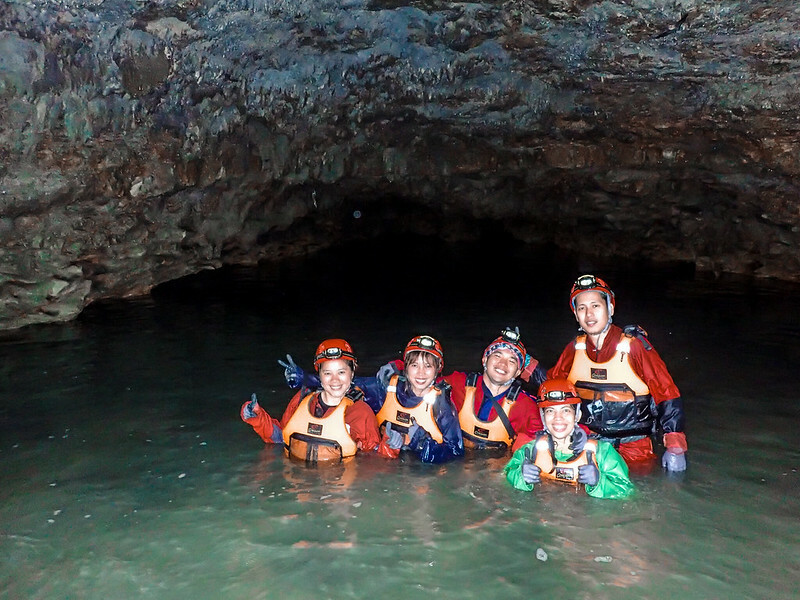 It ended on a stream of lukewarm water and we swam until we saw the light from the exit. 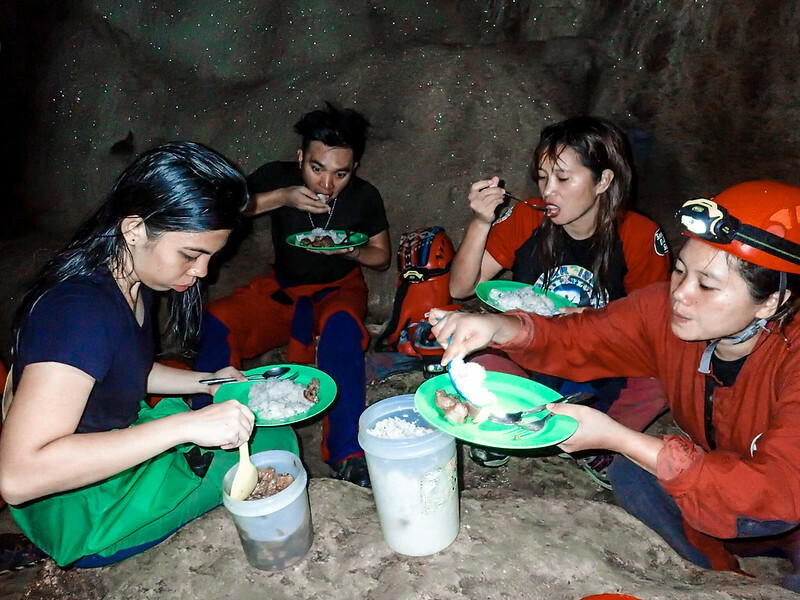 Still, nothing beats the heat of the afternoon sun after indulging ourselves for hours inside the cave. 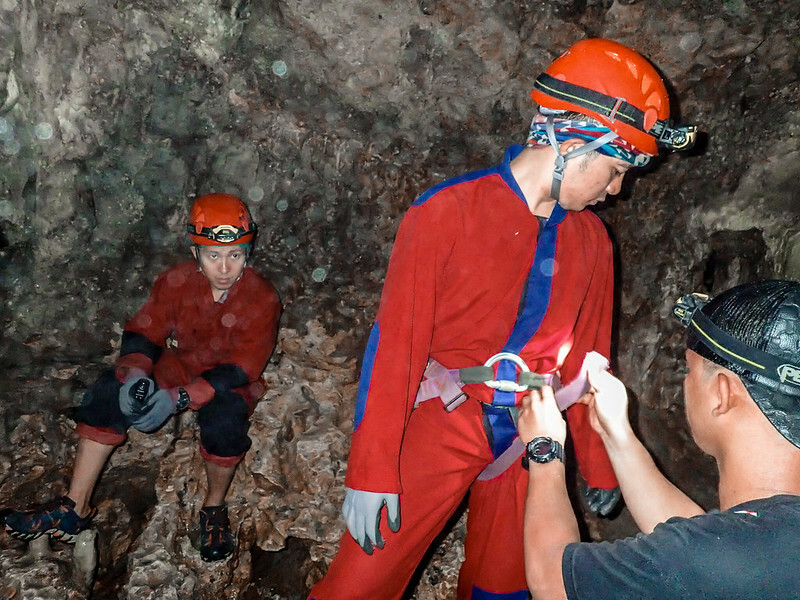 We took off our cave suits and walked through the dried-up riverbed near the exit. Bathing ourselves under the heat of the sun never bothered us. 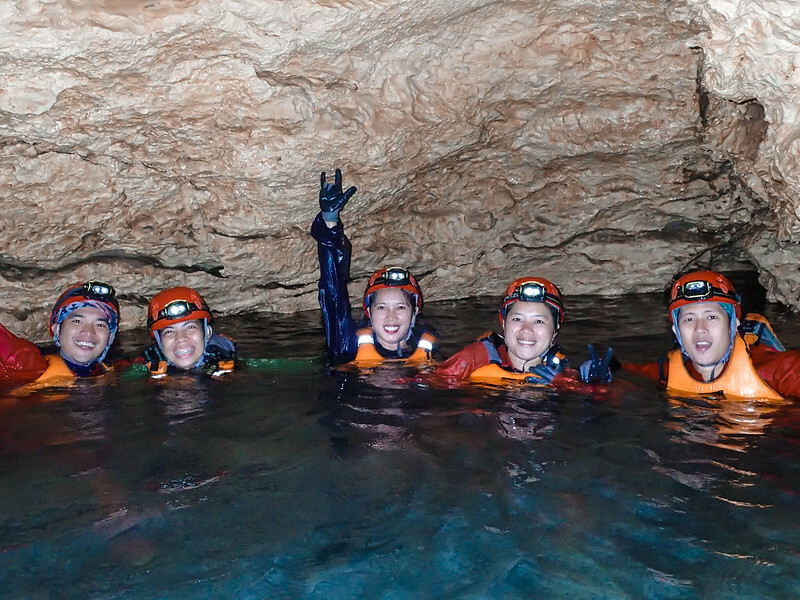 We needed our bodies to warm up after soaking in the cold waters of the cave for almost half a day. 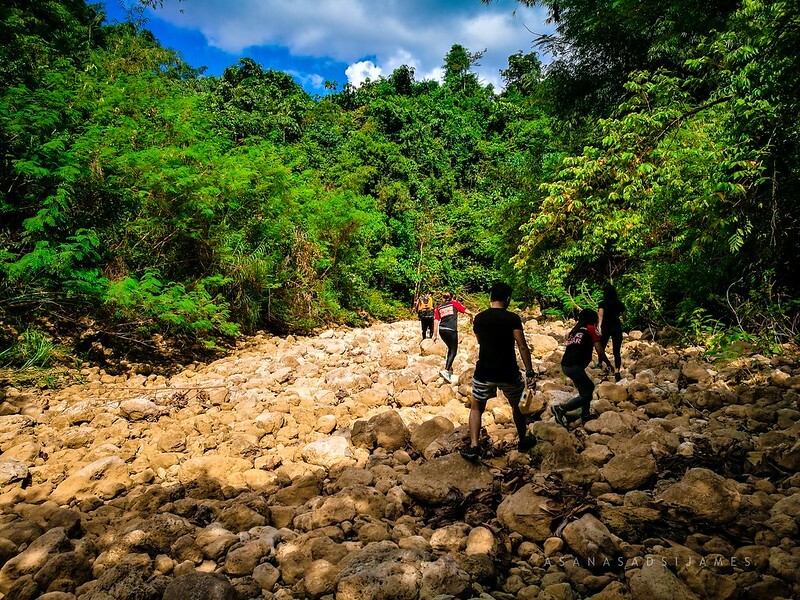 At the end of this dried up riverbed awaits our ride floating on the winding strip of emerald green waters, meandering and feeling its way to civilization. 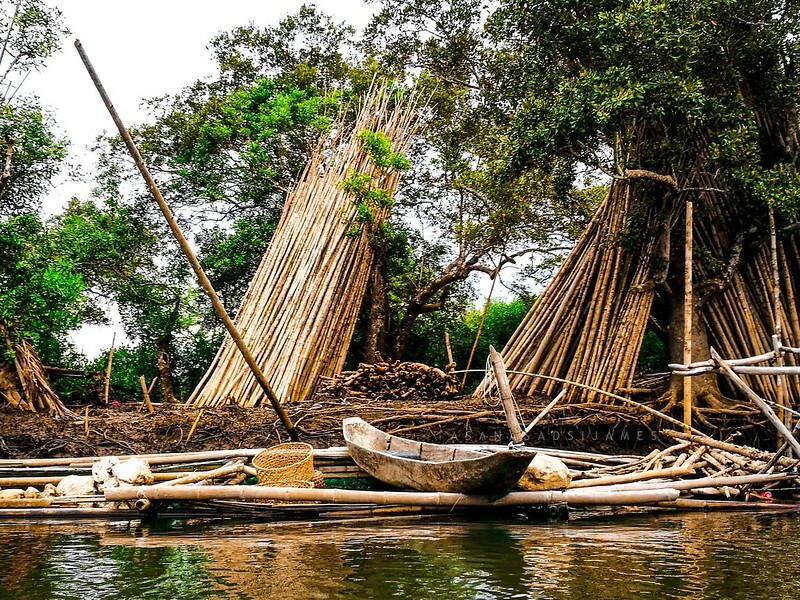 These dugout canoes were already prepared by our porters from the outside waiting us. 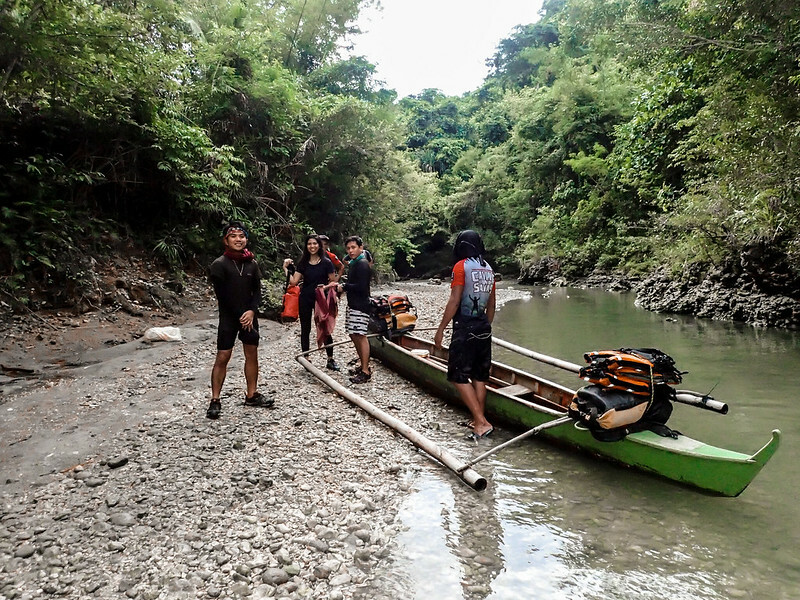 The calm waters of the river made our ride so soothing and relaxing. I almost fell asleep but never shut my eyes just to witness the beauty of this river. 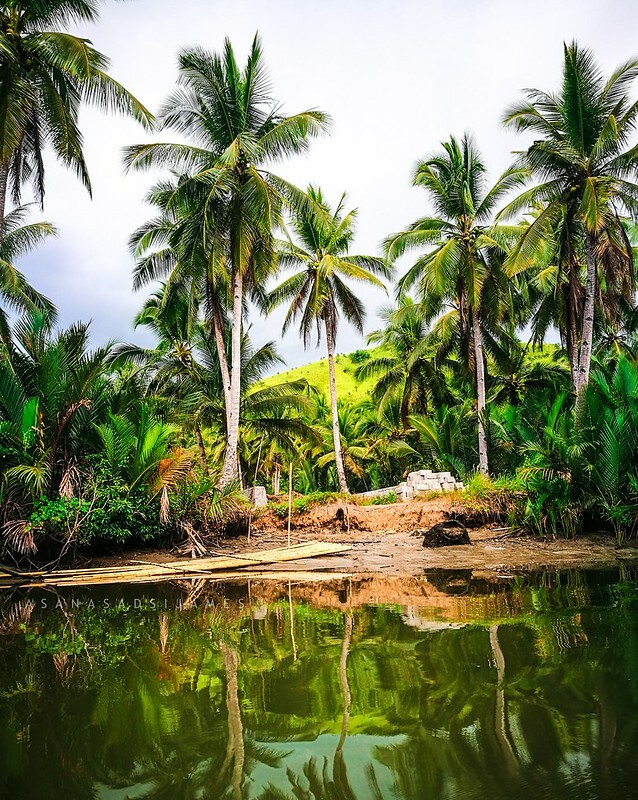 The calmness and stillness of the river made a natural mirror that reflected and doubled the beauty of the rural life of Samar. On a sandy shore up ahead where families of local people are enjoying the afternoon glow of the sun. 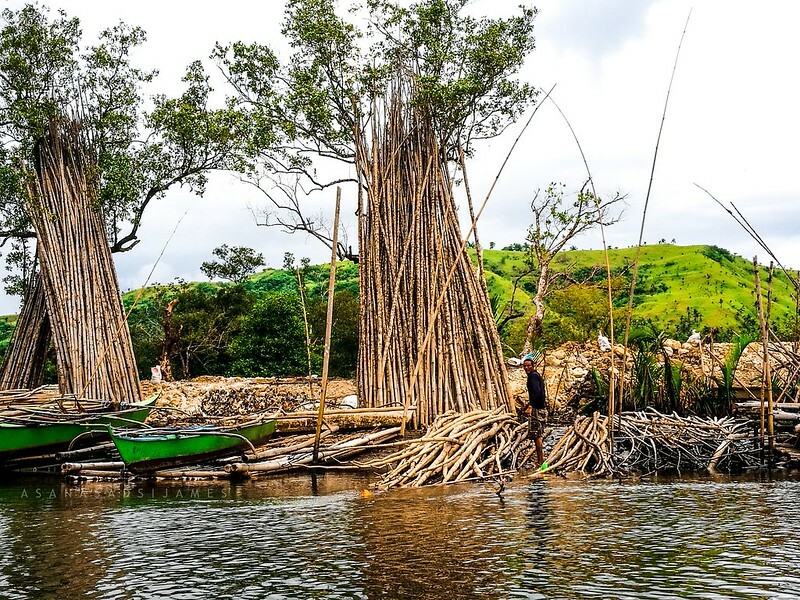 They showed how life in the province is so simple yet genuinely beautiful. 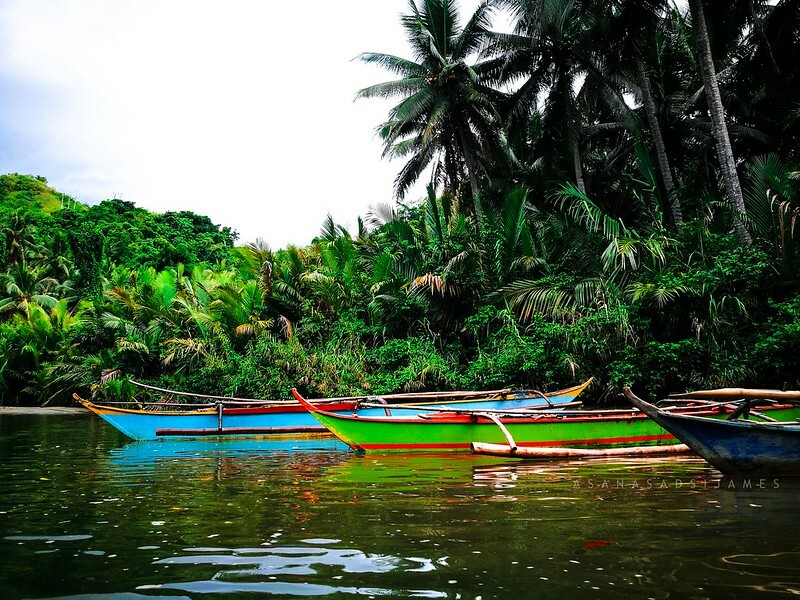 As our canoes passed in front of them, they threw us with their beaming smiles and waving happily with some sweet greetings of “Maupay nga Udto!” (Good afternoon!) and “Mangaon kita didi!” (Let’s eat here!). Such a simple gesture but that put up beautiful curves on our faces. 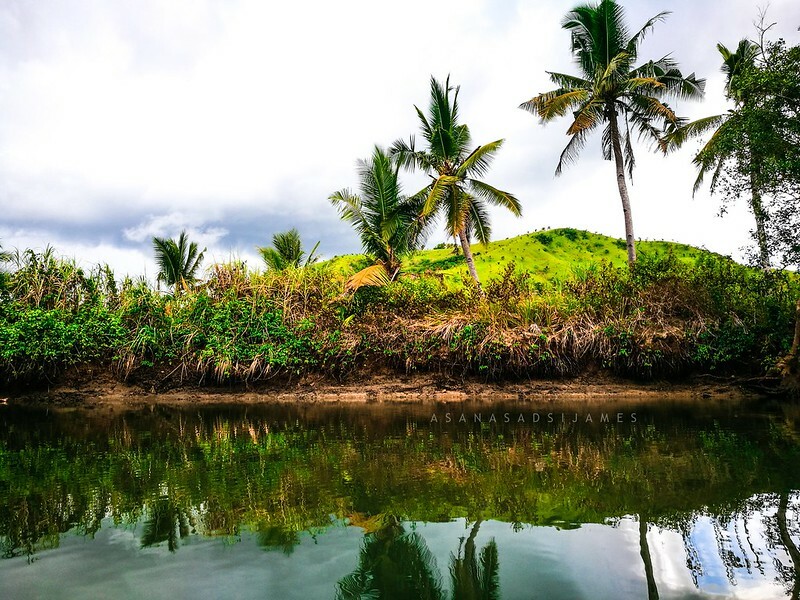 Samar never ceased to fill my heart with happiness. There, I found my answers to my questions above. 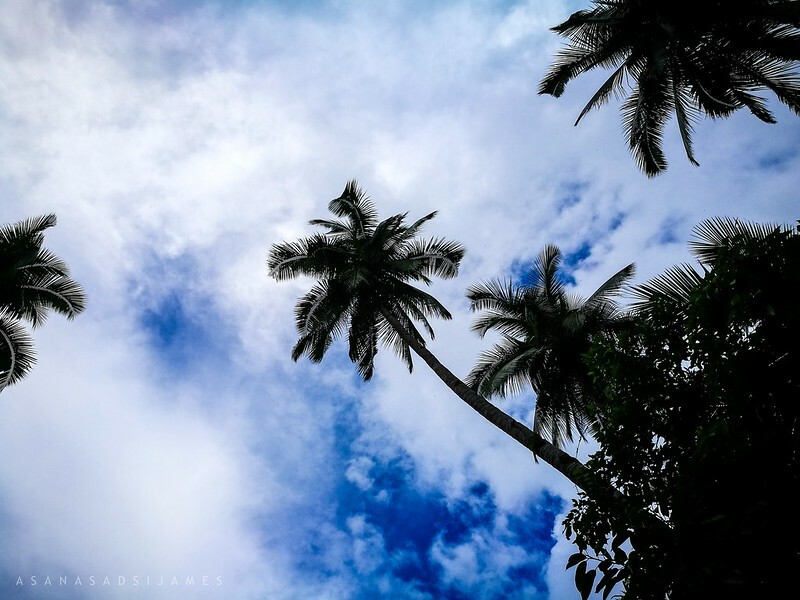 The giggling sounds soon faded and the tranquility took over again. 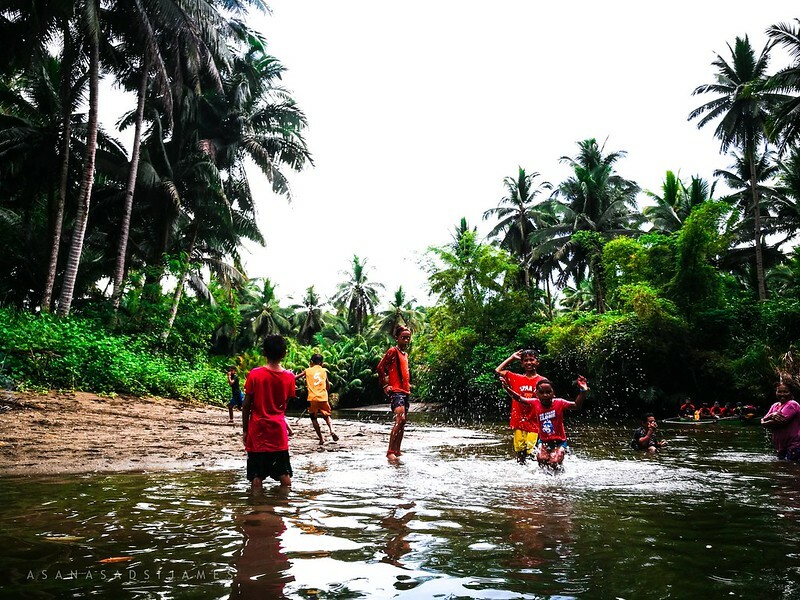 We enjoyed the last minutes with the cerulean and forest hues of the river, the warm sun on our faces, and the briny air of the river. 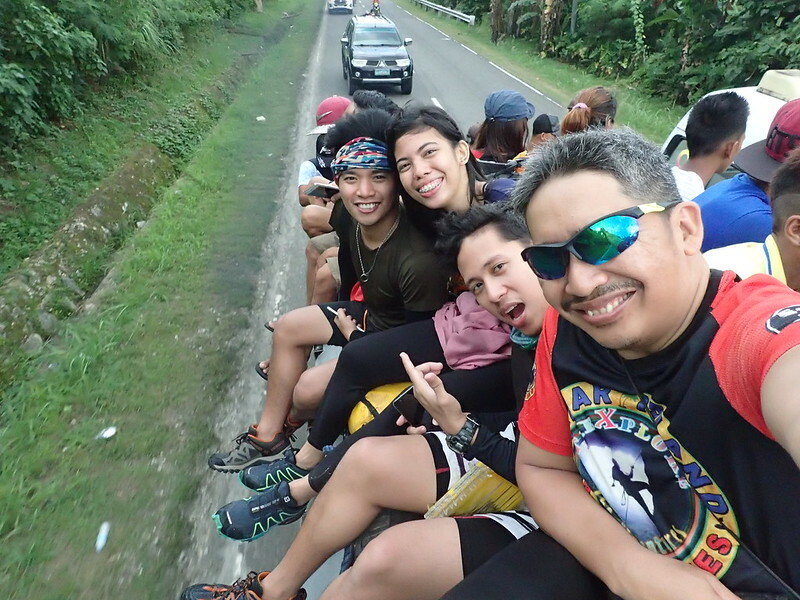 After the river cruise, we loaded off of our canoes and rode atop of a jeepney. 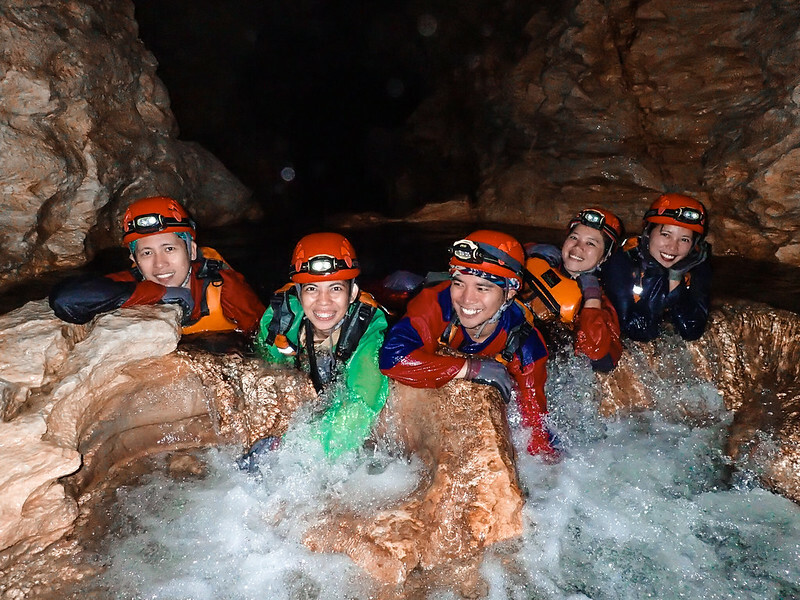 Toploading is the best way to cap off our Samar caving adventure with scenic views of sunset, mountains, and sea.